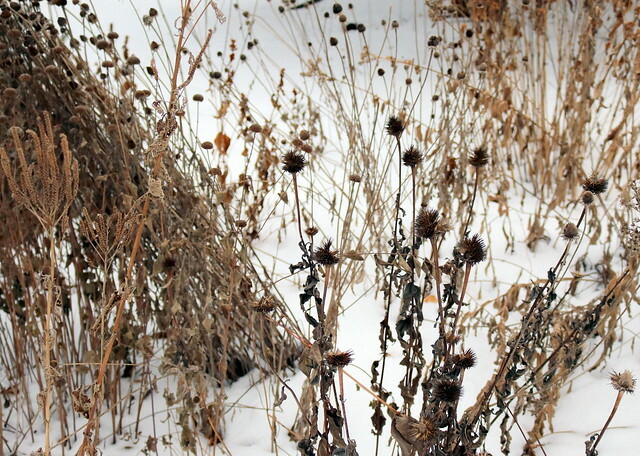 Spring is right around the corner, so I’d better quickly document what happened in the garden last year. Whorled milkweed wasn’t new to my garden this year, but it really took off after we put up chicken-wire fence to keep out the snacking rabbits. A few of the dozens of plants even bloomed! 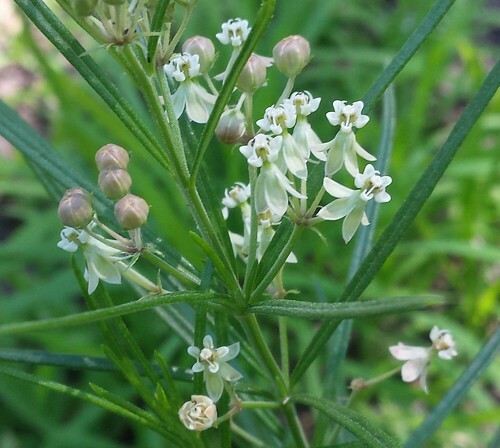 Similarly, poke milkweed isn’t new, but this was the first year it flowered. Such interesting, claw-like blooms! 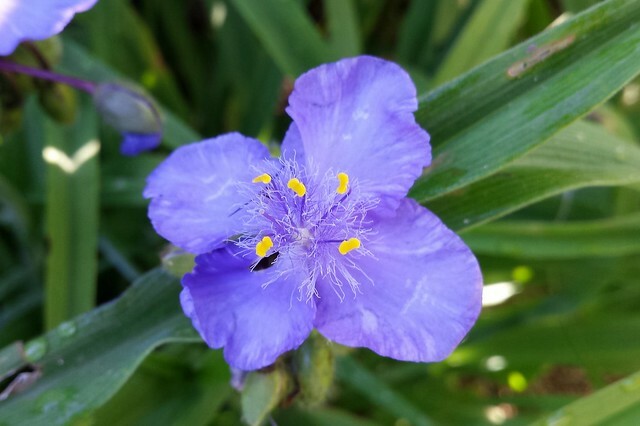 This flower didn’t produce any seeds. 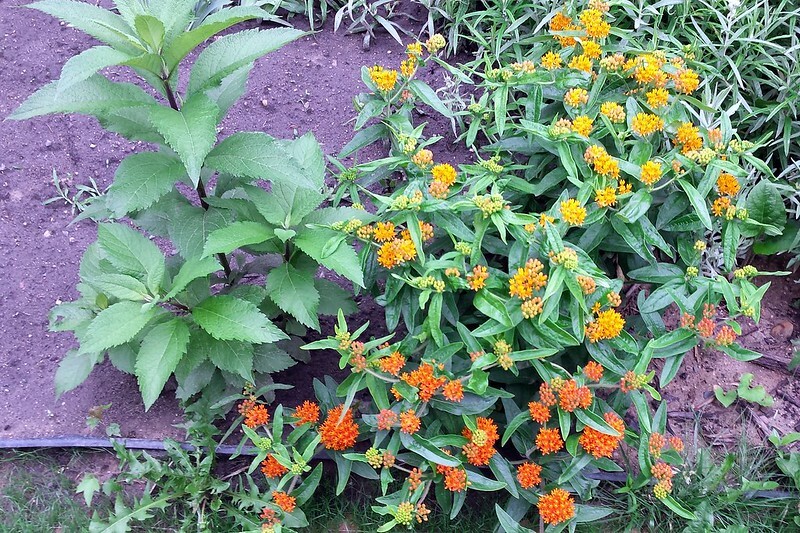 Our two-toned butterfly weed changed this year, due to street maintenance that dug a big hole in the front yard. 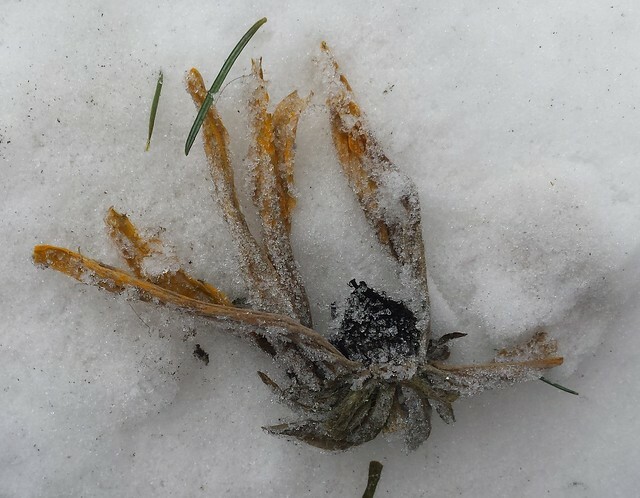 When the soil was returned, the plant came back, but rotated! Previously, the dark orange half was on the left, and the light orange half was on the right. 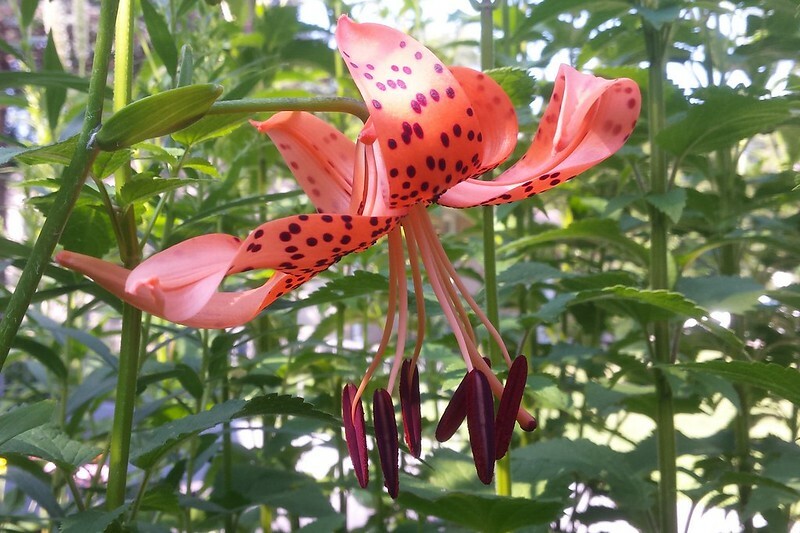 This tiger lily was a surprise. I didn’t even know the plant was there until it looked like this. I must have planted bulbs, but that would have been years ago. This little hitchhiker ended up on my capris after I strolled through the garden one evening. 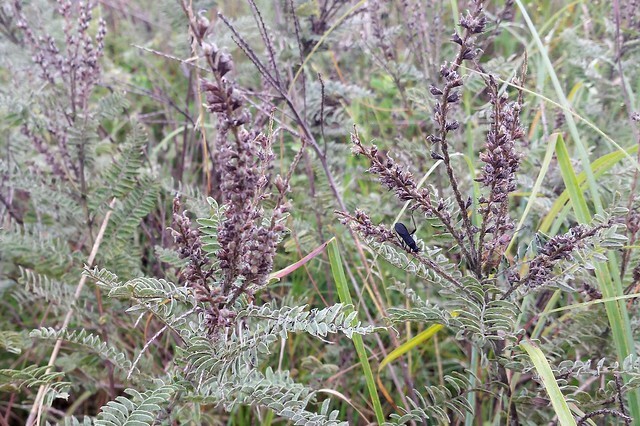 I decided to upload it to iNaturalist to see if anyone could help identify it — and I didn’t even have to wait for a live person because iNaturalist automagically suggested a name, genista broom moth. 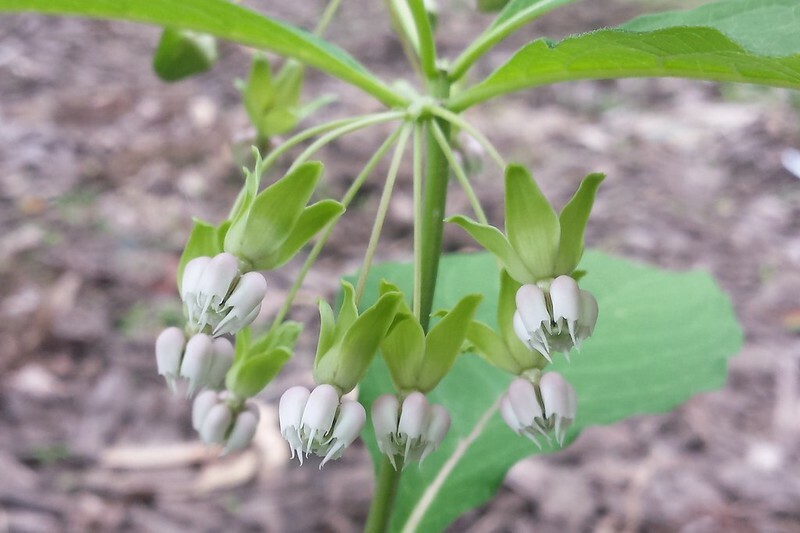 Sure enough, a host plant is baptisia, which I would have passed on my walk through the flowers. 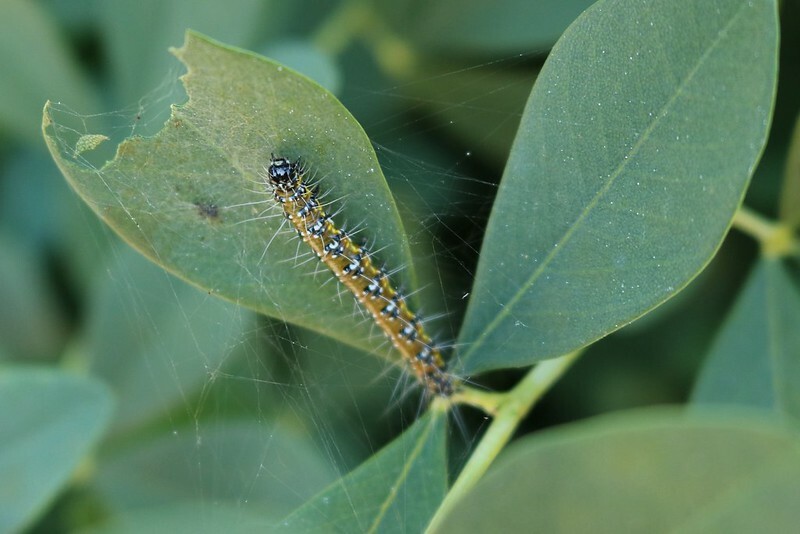 That was the only one I saw for awhile, but soon there were dozens, spinning webs and eating the leaves and, well, pooping a lot, as caterpillars do. 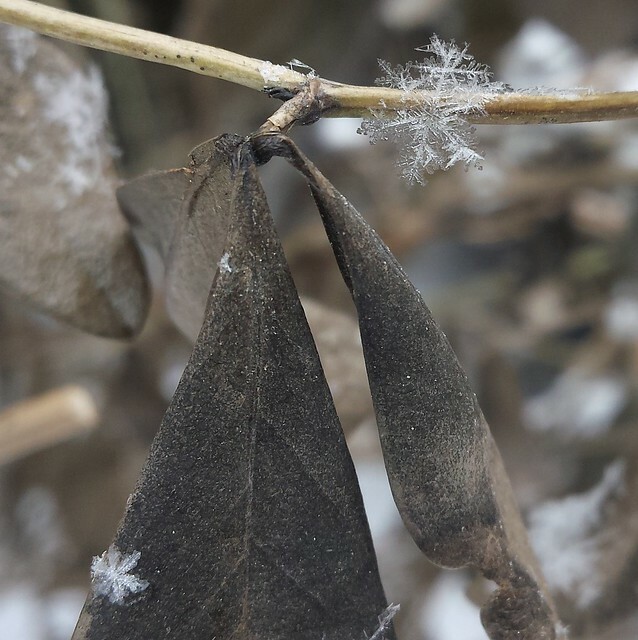 Later I found these two cocoons — one on the plant (I accidentally snapped off this leaf but then carefully tucked it back in) and one in a towel that was drying after wiping condensation from car windows. 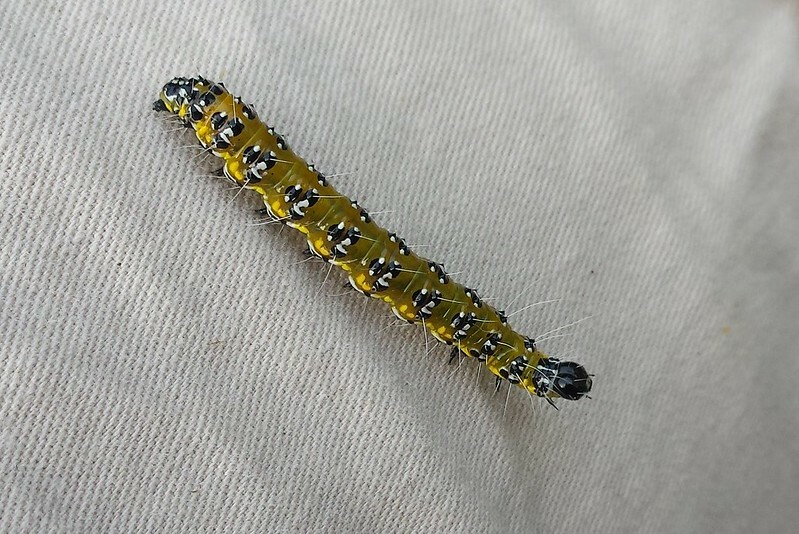 Not sure if either is from these caterpillars. 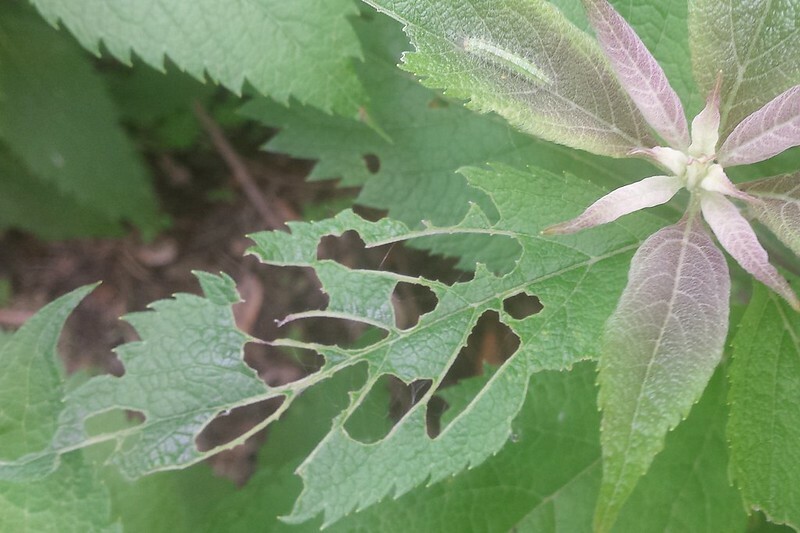 It took awhile to find what was eating the joe-pye weed leaves, since the culprit blends in so well. 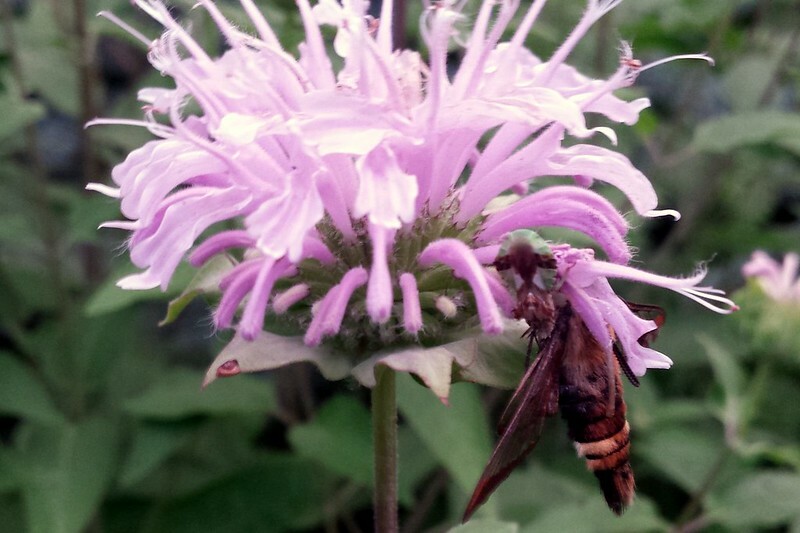 It’s a plume moth caterpillar, and the joe-pye weed bloomed just fine despite the holey leaves. 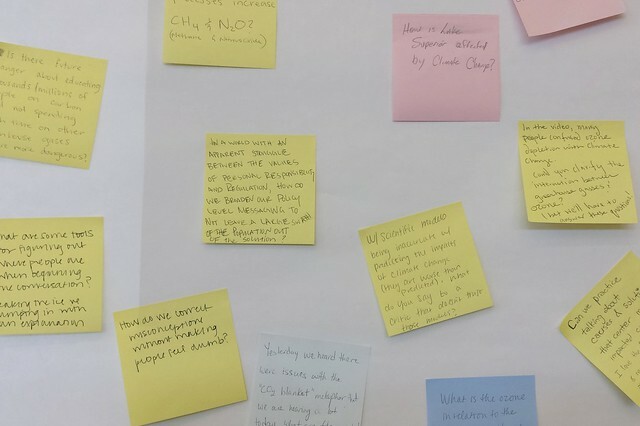 Nothing like getting a 2018 recap in under the wire! 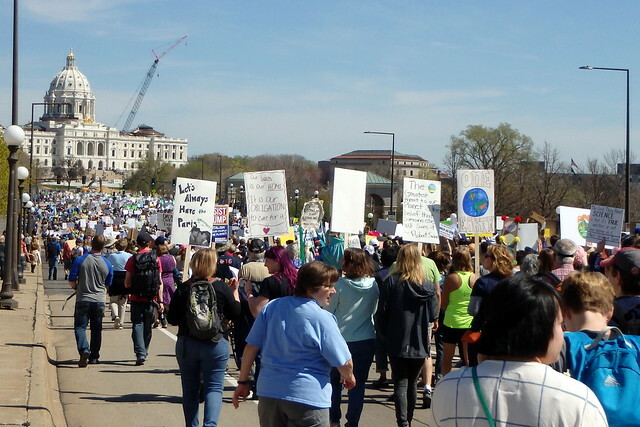 I’m a Minnesota master naturalist volunteer and spend a lot of time throughout the year volunteering for environmental events. It’s a requirement to complete at least 40 volunteer hours (plus 8 continuing education hours) to remain an active member, but it’s also one of the most fun and rewarding things I do every year. Many of my 2018 volunteer hours were stewardship, as in the previous two years. 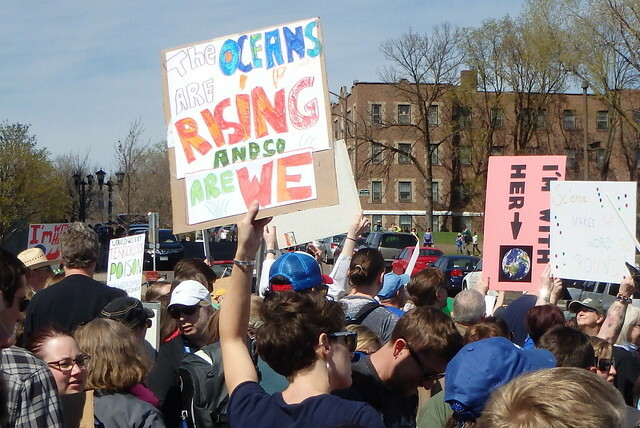 But this year, I also did a lot of citizen science activities, too. 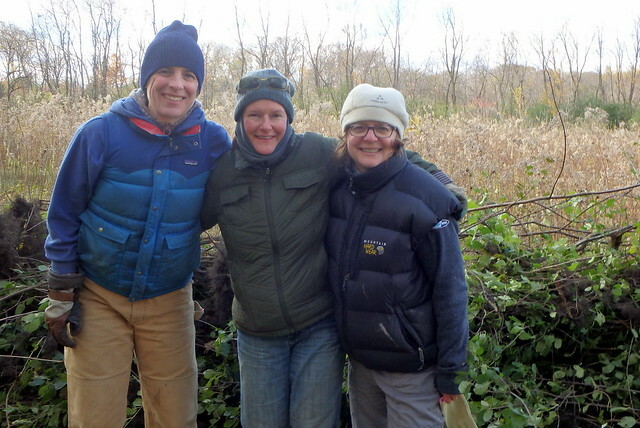 I recorded one education/interpretation event, co-leading a buckthorn removal event and info session for the capstone project of my second Minnesota master naturalist class. (Much more on the class later.) And I had one program support event. Stewardship events are noted with (S), citizen science with (CS), education/interpretation with (E/I), and program support with (PS). 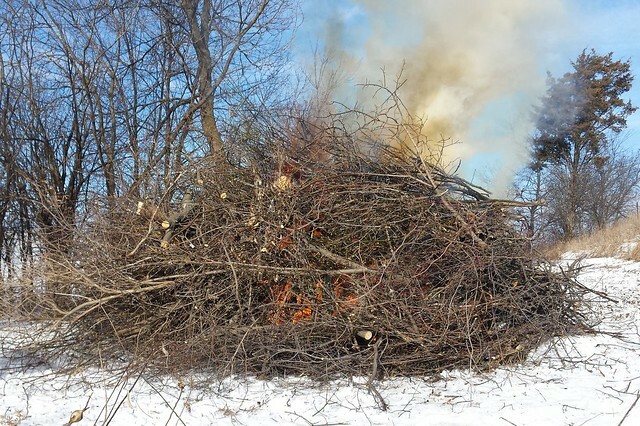 January 20, Lost Valley Prairie SNA (S): Buckthorn burn! 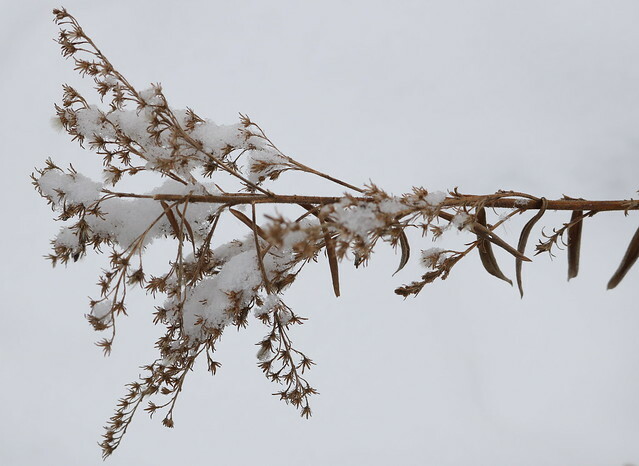 And other non-prairie trees and grapevine, too, that had been collected previously and added to during the burning. 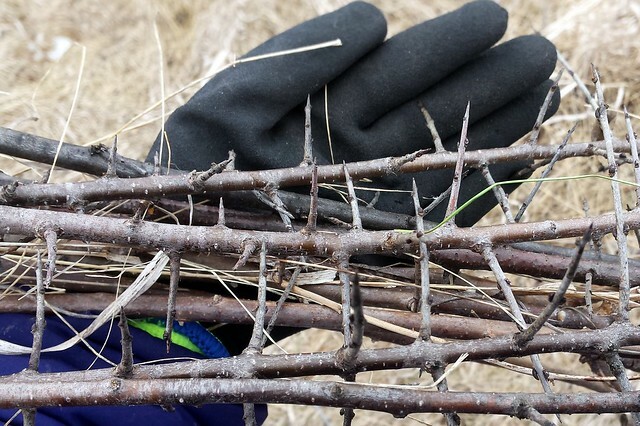 March 3, Roseville’s Central Park (S): Hauled buckthorn that other volunteers lopped and sawed. 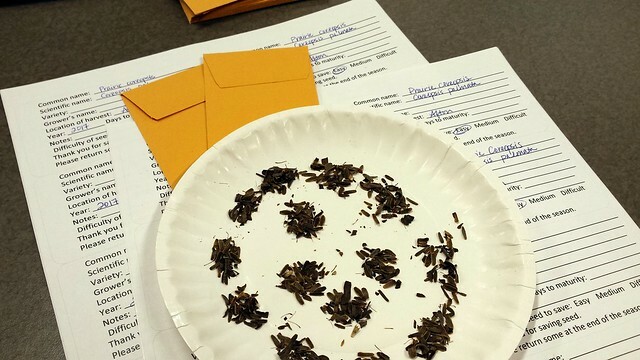 March 12, White Bear Lake Seed Library (PS): Packaged donated prairie coreopsis (coreopsis palmata) seed for the White Bear Lake Seed Library, which is in its third season. 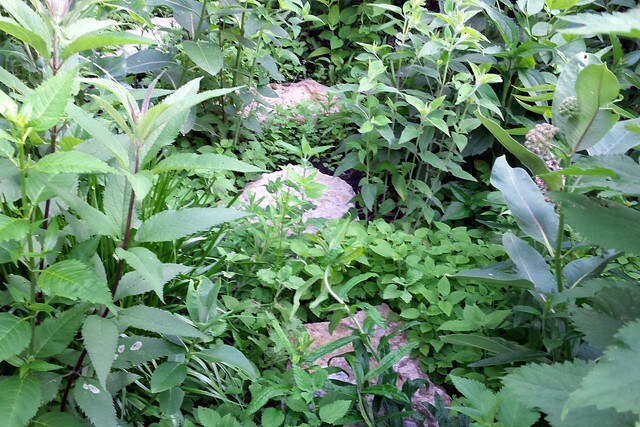 It’s fun to see how the native plant section has grown even since last year. 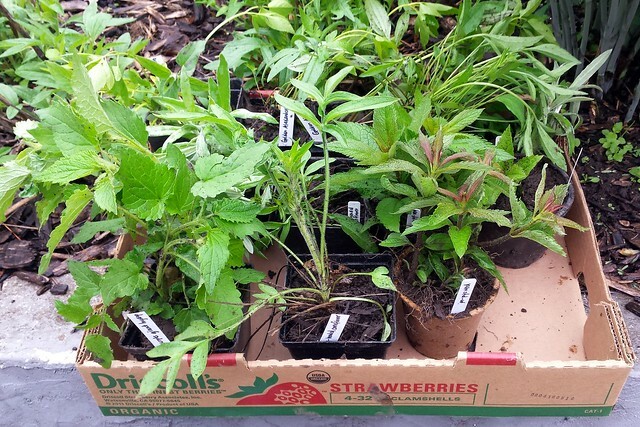 I “checked out” two native grasses and one sedge; I’ve “checked in” joe-pye weed and yellow coneflower in the past. 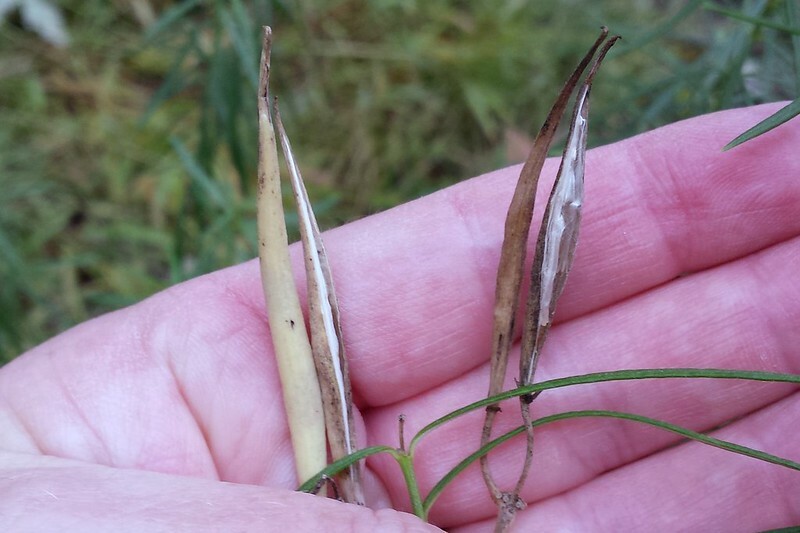 March 24, Lost Valley Prairie SNA (S): Brush cutting, treating, and burning. 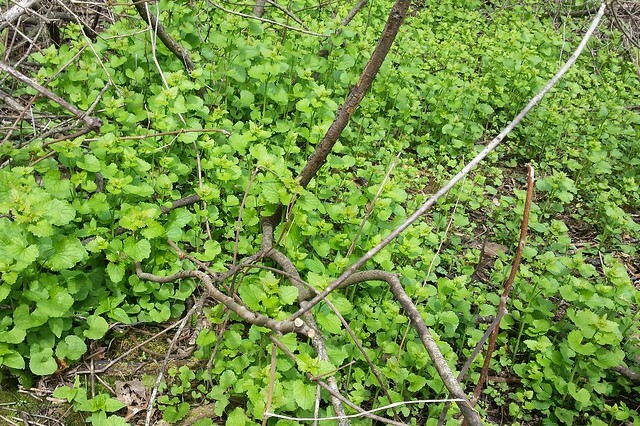 May 3, Lebanon Hills Regional Park (S): First garlic mustard pull of the season. 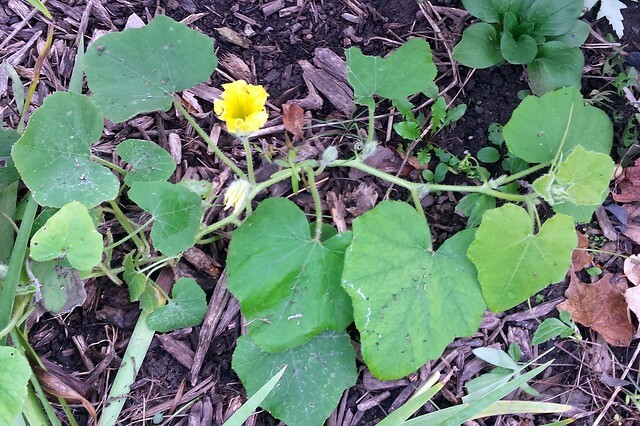 The spring is so late, the plants were small and easily confused with a buttercup. May 5, Eloise Butler Wildflower Garden (S): Very warm early-spring afternoon for pulling garlic mustard in a bowl just outside the garden. 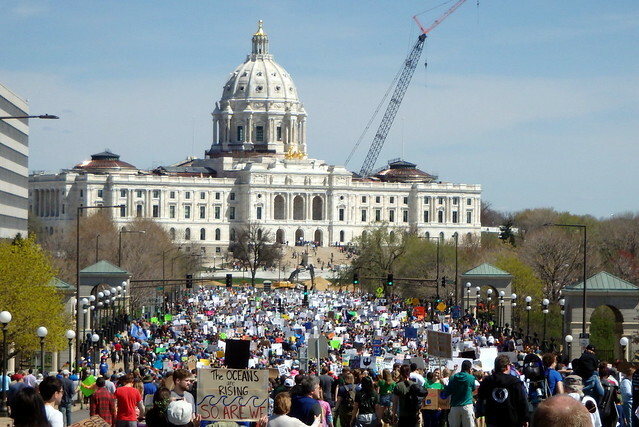 The commute was extra-long because 94 was closed in downtown Minneapolis. 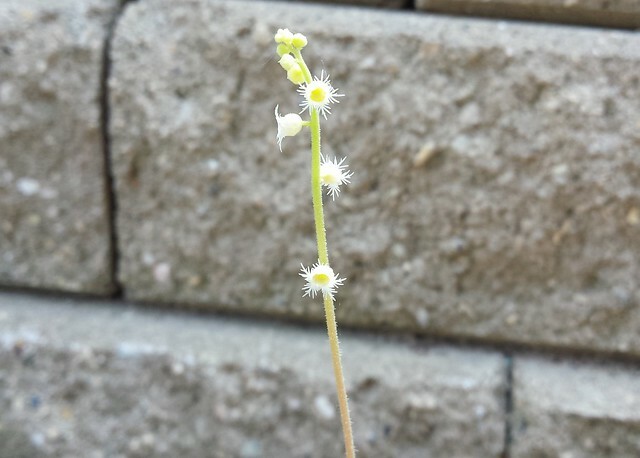 May 11, Hyland Lake Park Reserve (S): Pulled narrowleaf bittercress, a new one for me that is so far only found in the metro area in Minnesota. 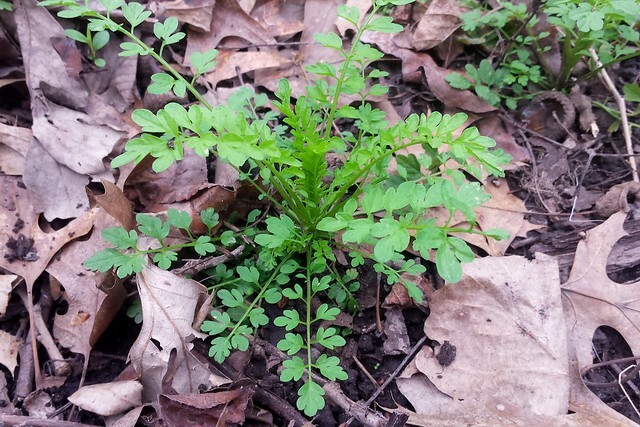 Small plants so far this year, but parts of the woods just in from the trail were pretty thick. Also pulled some garlic mustard along the trail. 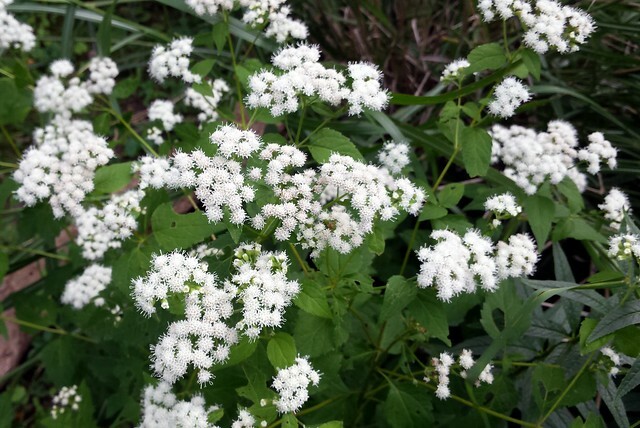 May 12, Roseville’s Villa Park (S): Garlic mustard pull. 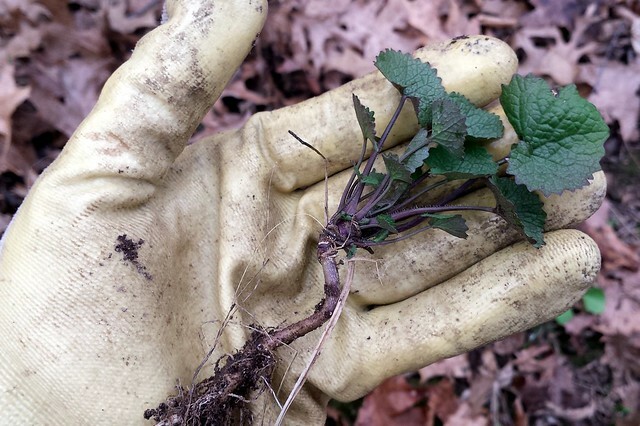 May 16, Hampton Woods WMA (S): Garlic mustard pull with Friends of the Mississippi River, with a little bit of buckthorn seedling pulling for good measure. 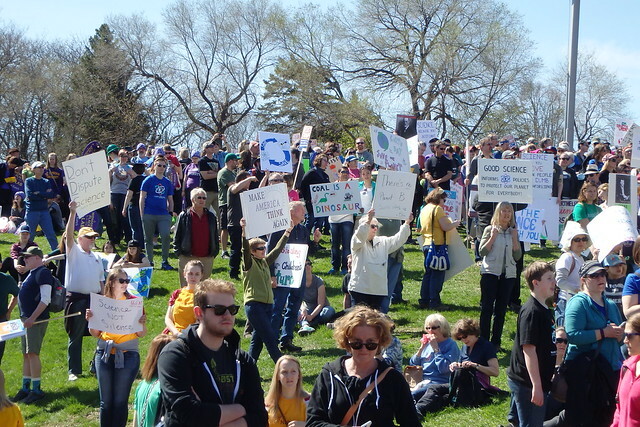 There were way too many volunteers for the amount of work, so this was mostly a hike (entire event was 2 hours). In fact, I didn’t even pull any garlic mustard; I sought out buckthorn instead. 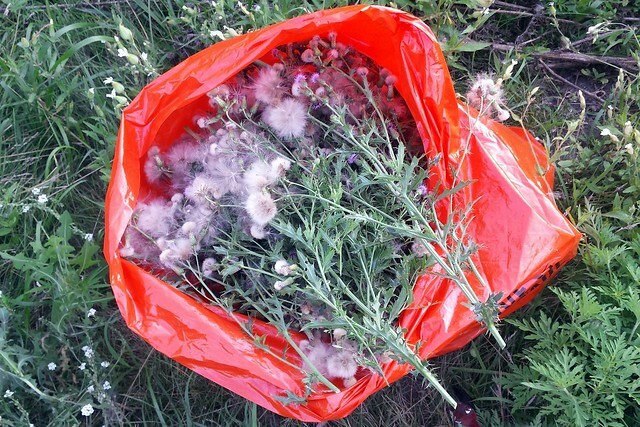 May 31, Minneapolis’s Ole Olson Park (S): Dug and pulled weeds (Canadian horseweed and black medic and dandelions) from the demonstration prairie on the west bank of the Mississippi River, just north of downtown Minneapolis, with Friends of the Mississippi River. 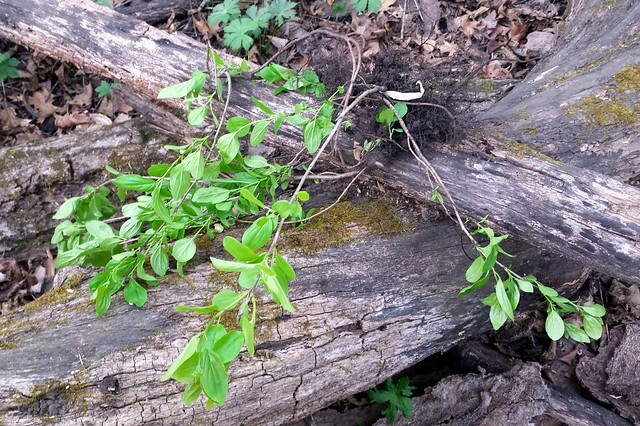 June 12, Coldwater Spring (S): Pulled narrowleaf bittercress, which had grown significantly since I saw it a month ago (in a different park). Trying to get as much of it as possible before the long seed pods ripen and burst. 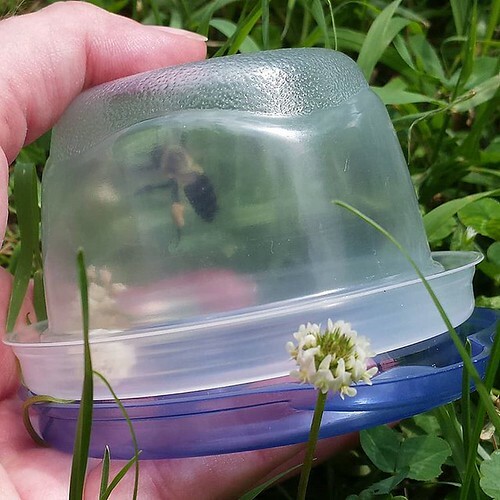 June 17, Como Regional Park (CS): Kickoff of the 2018 bumble bee surveying season. I found 5 or 6 (lost count) of the 19 the group collected. 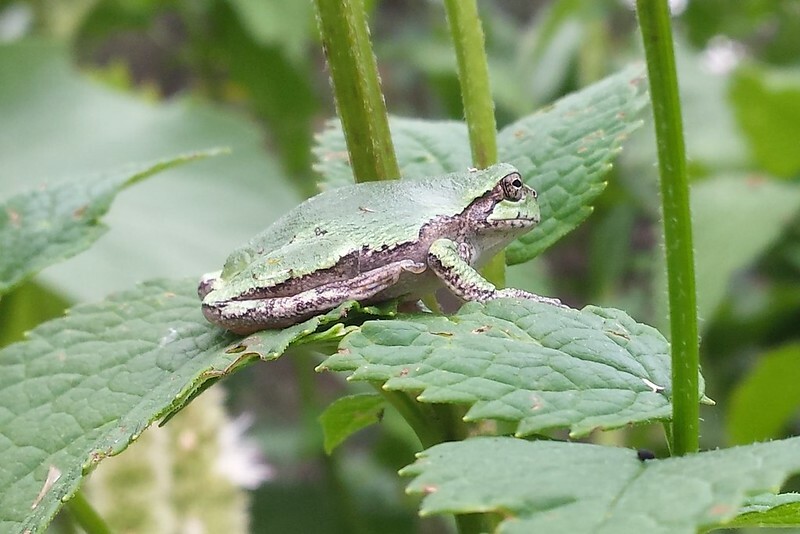 Today was hot and muggy and we found all except one on white clover (the exception was motherwort), maybe because not much else is blooming right now. 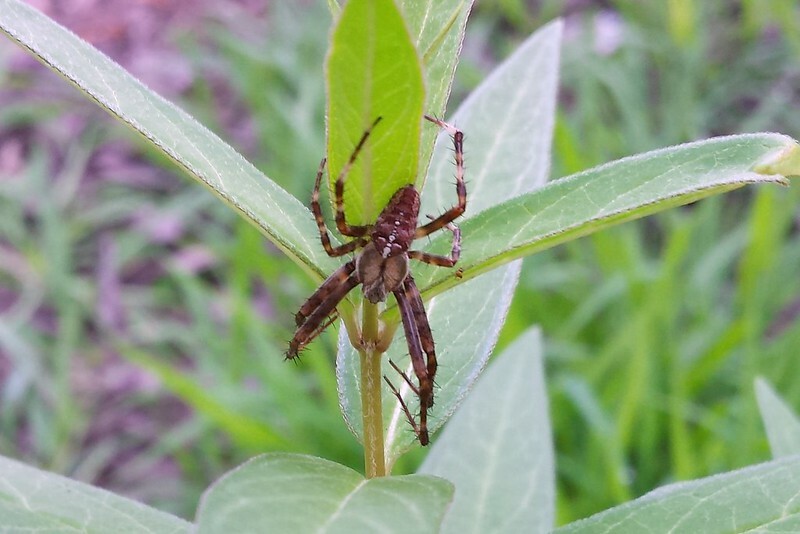 June 22, Minnesota Valley National Wildlife Refuge, Rapids Lake Unit (CS): Bioblitz in the new Anderson-Lenzen Tracts adjacent to the Rapids Lake Unit. I had a morning appointment so joined a group after their lunch break, when they headed to a new area. 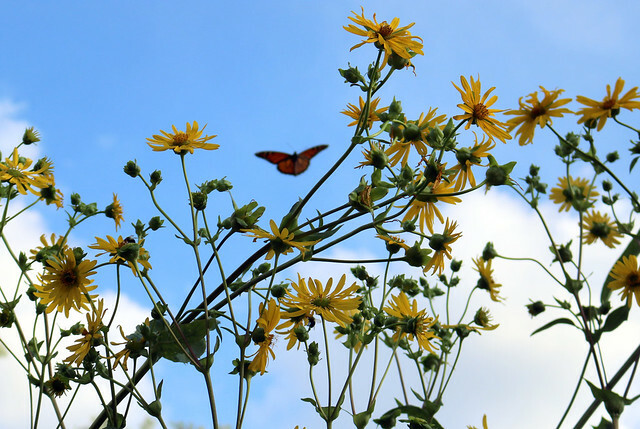 We recorded 84 species of wildflowers, grasses, trees, birds, and insects. 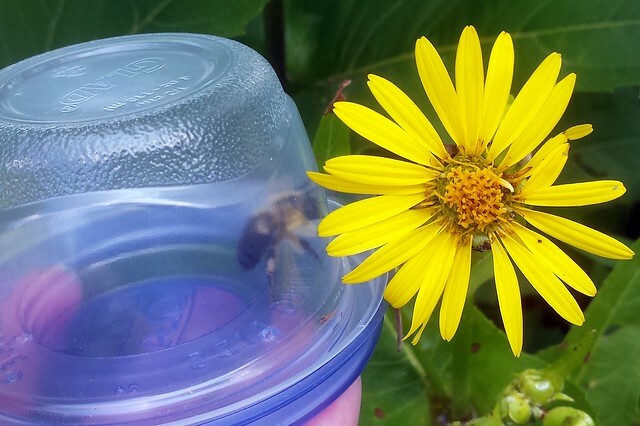 July 7, Como Regional Park (CS): Sunny morning collecting bumble bees with my niece and about 10 other volunteers. 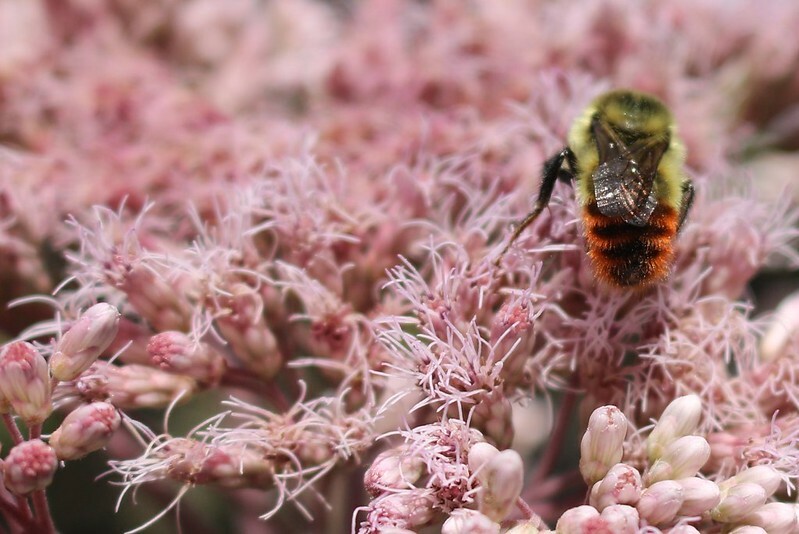 Many more flowers were in bloom than the last time I participated, so we gathered 99 bees compared with 19 just three weeks earlier. 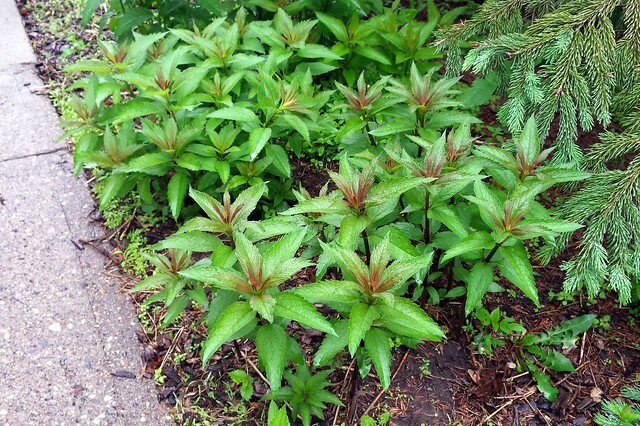 All were of the three most common species, and most were found on monarda. 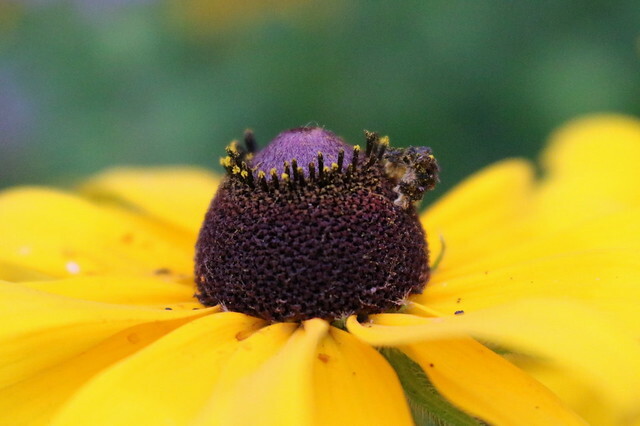 July 8, Como Regional Park (CS): Wasn’t planning to collect bumble bees two days in a row, but when Elaine Evans said she was going to try something a little different, I had to see the results. 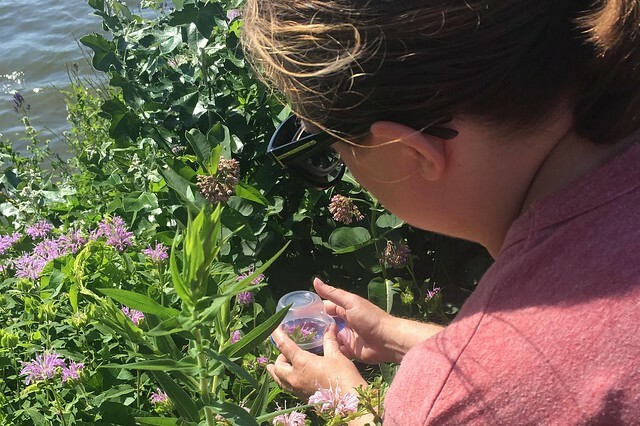 This time, we 10 volunteers collected all the bumble bees we could find, including ones with a red dot that showed they had been counted on a previous day. 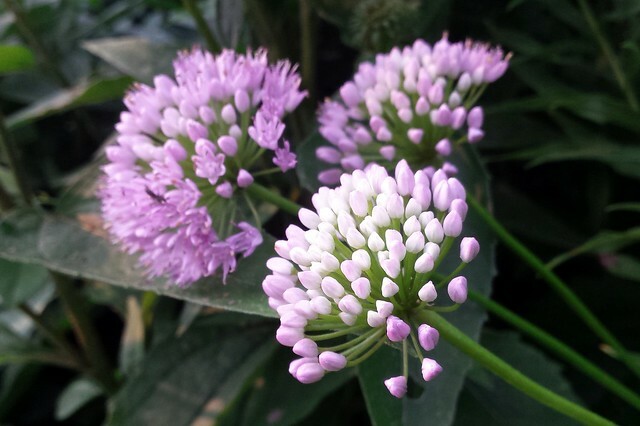 (Today’s bees were marked with purple, and we did not re-collect those ones.) It was a lot hotter, and there were a few more bees this time. 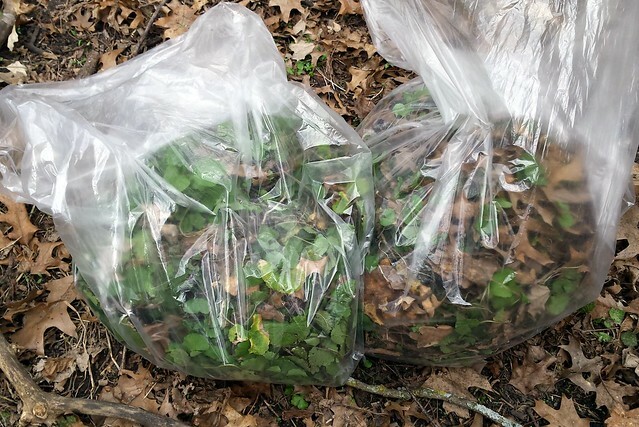 Of the more than 100 collected, only about 1/3 had been caught previously. 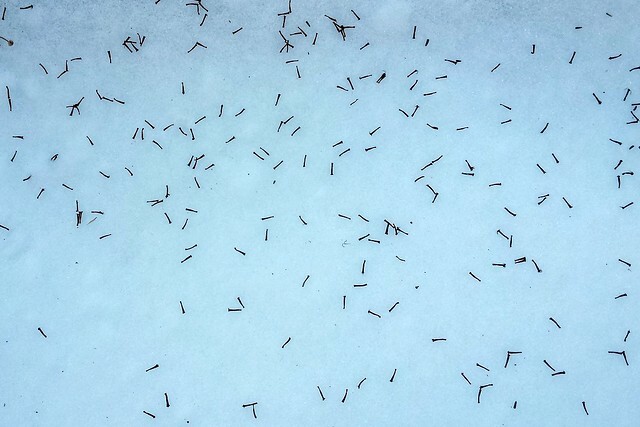 We found the three most common species again, plus two that weren’t found yesterday. Again, most were on the monarda. 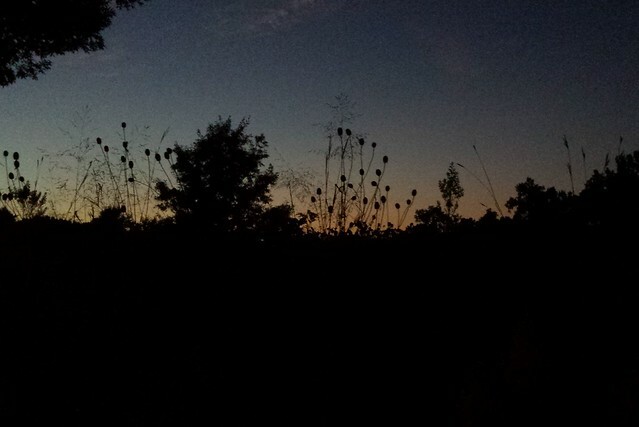 July 10, Bruce Vento Nature Sanctuary (S): Muggy evening of snipping Canadian thistle (already in seed) and burdock (in bud). 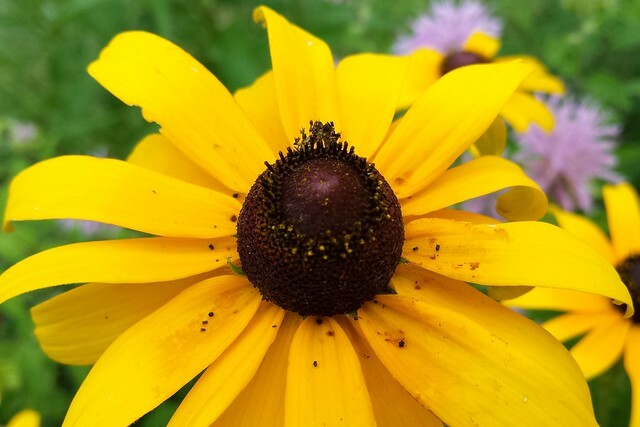 July 19, Shoreview’s Island Lake Elementary: Maintenance of a full-sun native pollinator garden, with the Big River Big Woods chapter of Wild Ones. 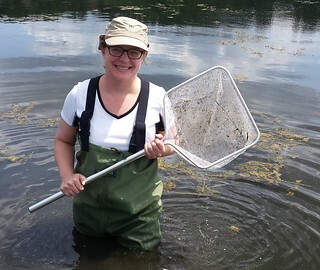 July 27, Lilydale Regional Park (CS): Beautiful afternoon for collecting dragonfly nymphs for the Dragonfly Mercury Project study of mercury in national parks. 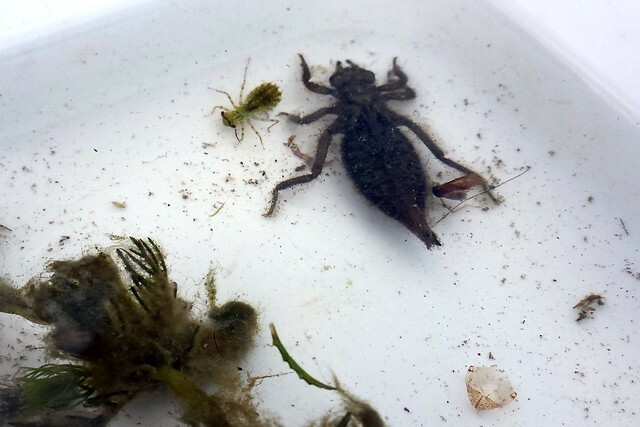 The amount of mercury found in these insects can be an indicator of the health of the ecosystem. 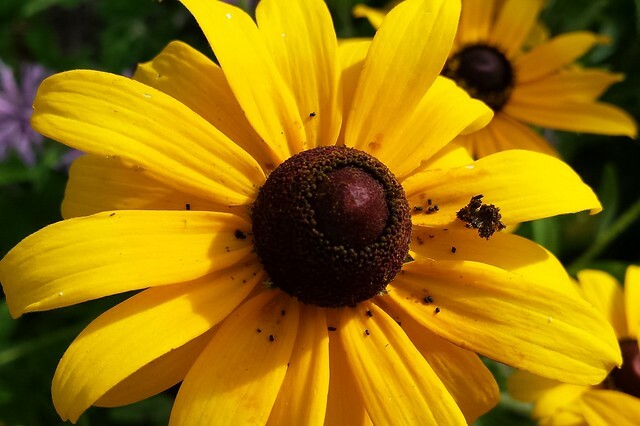 July 29, Como Regional Park (CS): Sunny day, not too hot, lots of flowers, lots of bees. 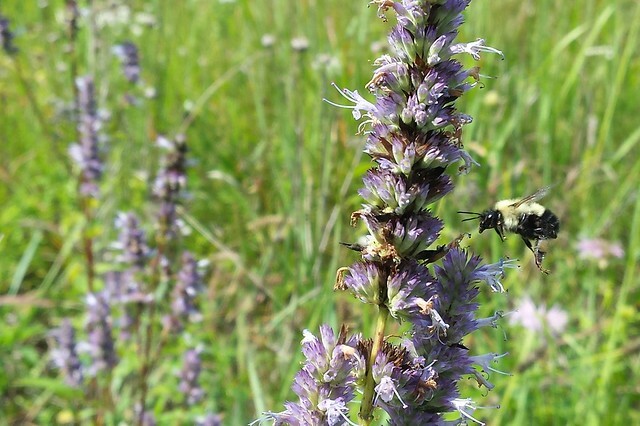 The group collected, marked, and released about 150 bumble bees, with six species represented, but no rusty-patched. August 5, Lebanon Hills Regional Park (CS): My first MycoBlitz! And only the second ever in Minnesota. 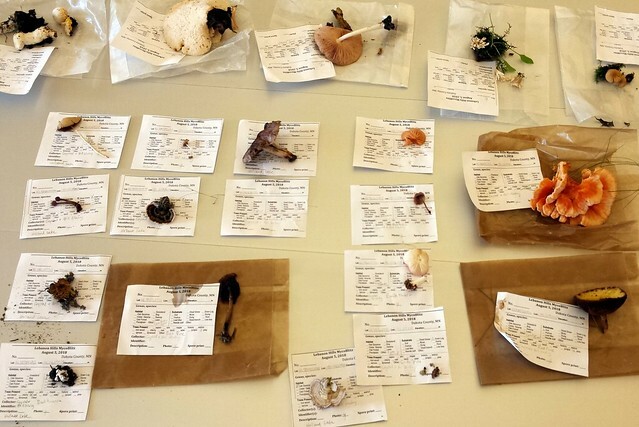 My husband and I helped collect fungi for the MN Mycoflora Project and eventually for Bell Museum’s mycological collection. Started with a long presentation on mushrooms and then a demonstration on how to collect. 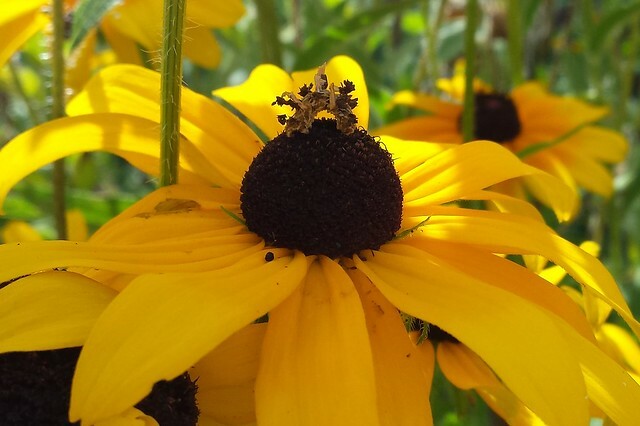 August 6, Crow-Hassan Park Reserve (CS): Bumblebee survey with a lot of Three Rivers Park District staff, in two locations of the park. We were there 2.5 hours, but there were too many bees for the identifiers to keep up. 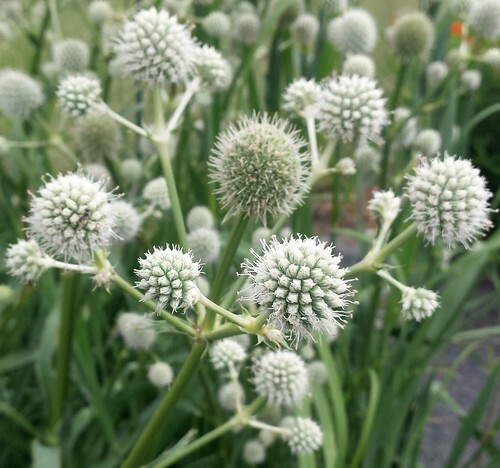 Absolutely gorgeous day — sunny and 80 — with flowers blooming that I’ve collected seeds from in previous years. 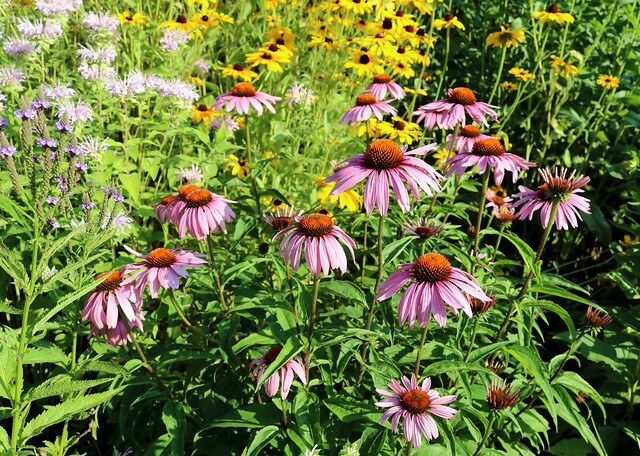 August 9, Shoreview’s Island Lake Elementary (S): Maintenance of a full-sun native pollinator garden with the Big River Big Woods chapter of Wild Ones. 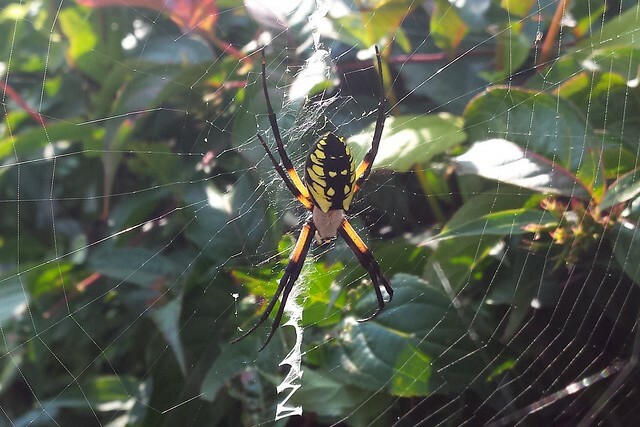 This beautiful yellow garden spider was so patient with the five of us who were taking her photo. 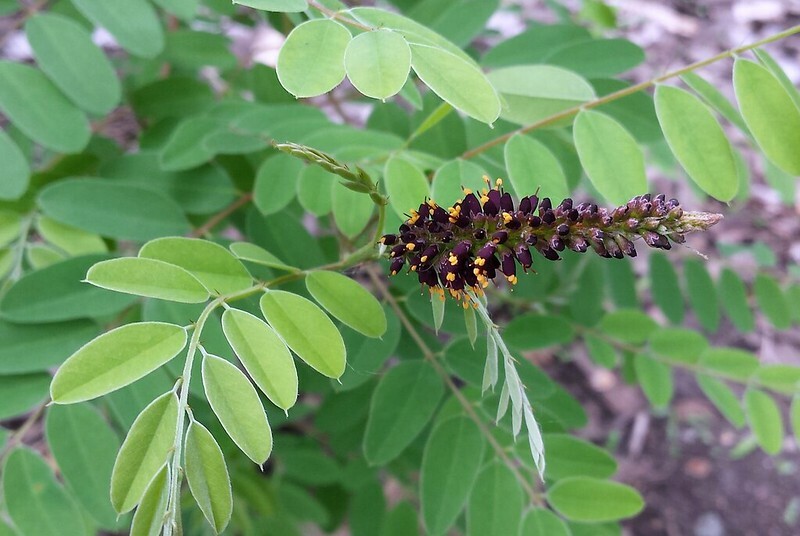 August 25, Crow-Hassan Park Reserve (S): Seed collection — purple and white prairie clover, round-headed bush clover, leadplant, and cinquefoil — for Three Rivers Park District. 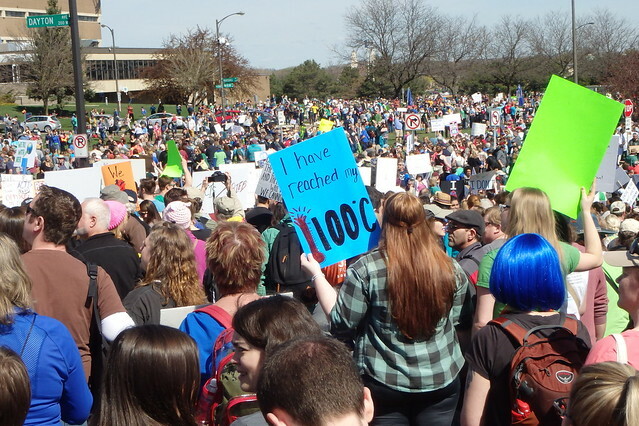 A PBS crew was filming the event. 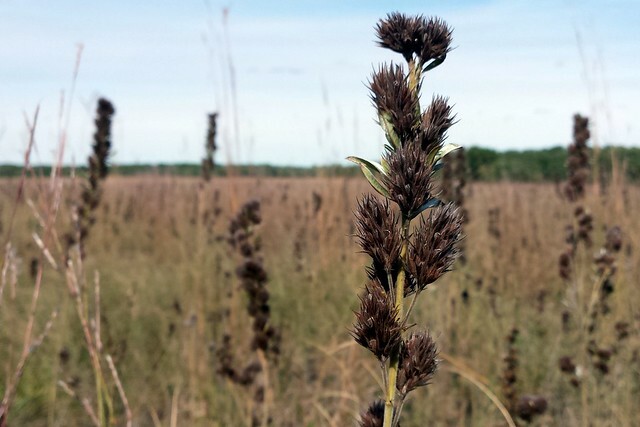 September 5, Phalen Regional Park (S): Seed collection — bottlebrush grass, Golden Alexanders, and boneset — with Saint Paul Natural Resources. September 6, three parks (CS): Coyote howling survey with Mississippi National River & Recreation Area! Emailed description: “Each night we will visit three separate stations, each at least 2.5 km (1.5 mi) apart. Volunteer positions: data recorder, audio recorder, game caller operator, and bearing recorder. Upon arriving at the station, we will have a minute of silence to allow the night to settle around our disturbance. Using the game caller we will play a pre-recorded coyote sound three times each followed by 90 seconds of listening. If at any point a coyote responds we will move on to the next station. Note: there is a chance no coyotes will respond during a survey — remember that no responses is still good data!” Results: A confirmed coyote response at the first station — a group yip-howl that goes on for at least 40 seconds. This was the only observed coyote response of the 9 attempts. 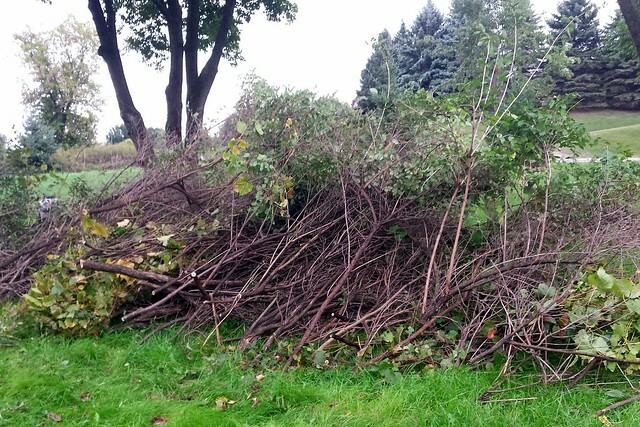 September 18, Inver Grove Heights’s River Heights Park (S): Buckthorn and honeysuckle lopping/hauling with Friends of the Mississippi River. 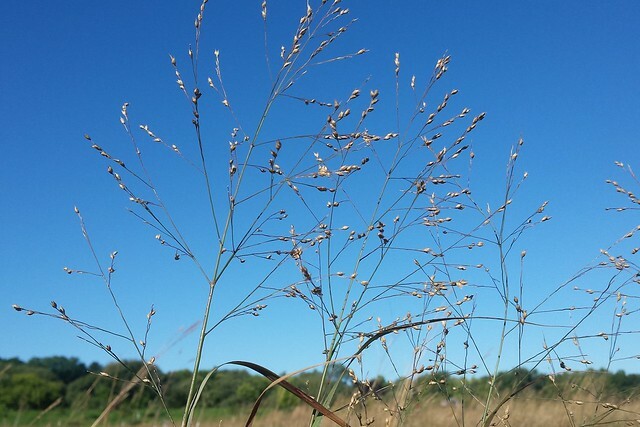 September 22, Inver Grove Heights’s Heritage Village Park (S): National Public Lands Day stop 1: Collecting switchgrass and little bluestem seeds with Friends of the Mississippi River. 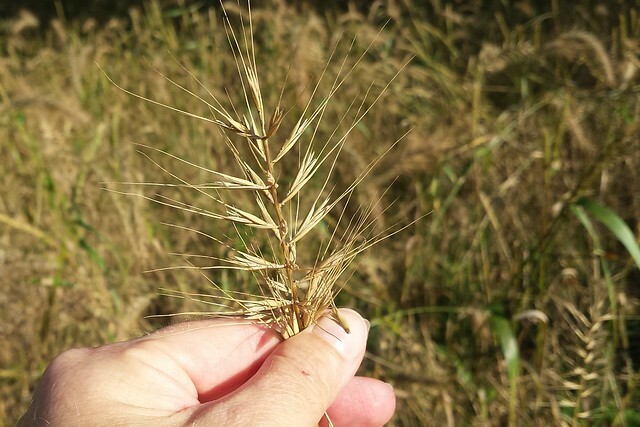 September 22, Lost Valley Prairie SNA (S): National Public Lands Day stop 2: collecting grass and flower seeds for Lost Valley Prairie Scientific and Natural Area. 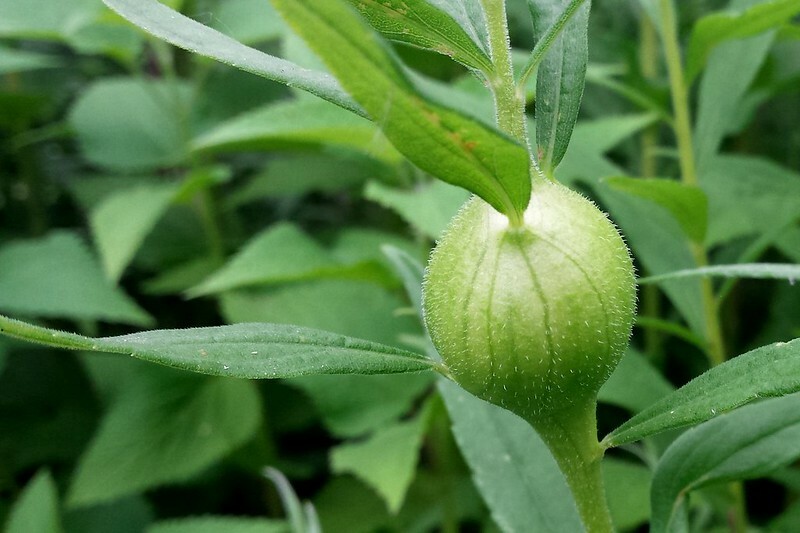 First time I had seen Virginia mountain mint and false gromwell. 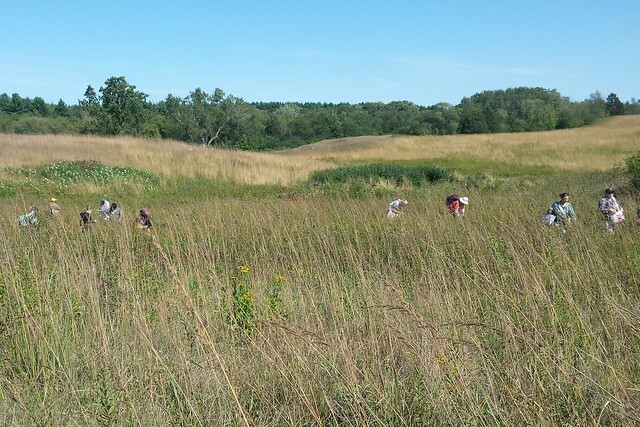 September 23, Wild River State Park (S): Seed collection with a friend (and several people we didn’t know) in a restored prairie on a sunny autumn afternoon. 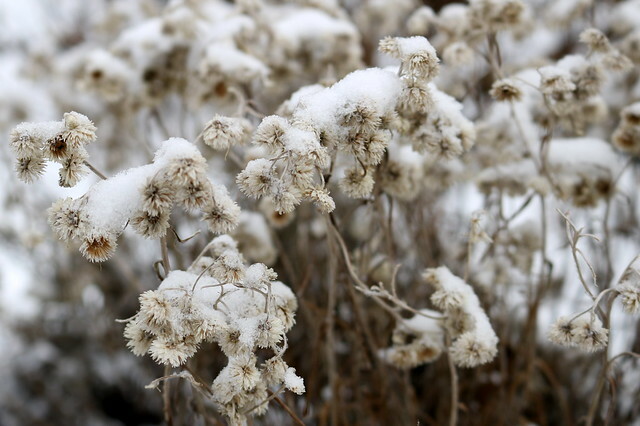 Thimblewood, round-headed bush clover, purple and white prairie clover, blazingstar, and more. 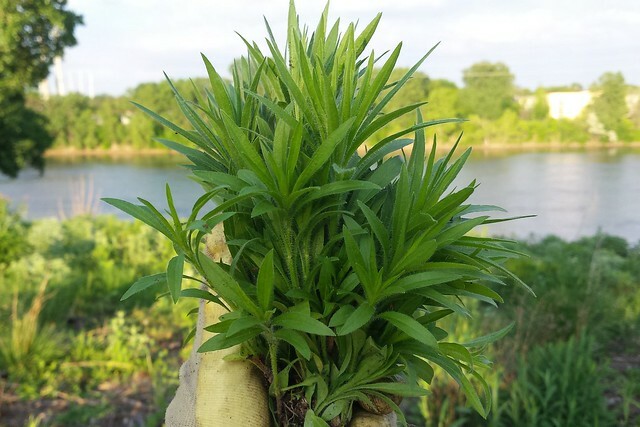 September 25, South Creek near Farmington (S): Volunteers planted plugs in the floodplain forest along South Creek, a tributary of the Vermillion River, with Friends of the Mississippi River. 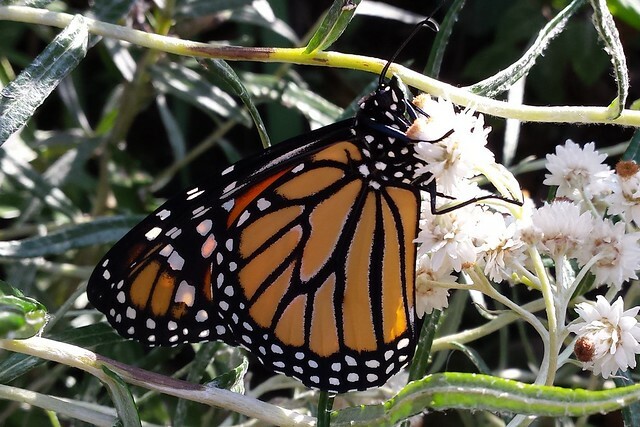 Summer 2018 (CS): Raised and tagged 5 monarchs from the migration generation. And that all adds up to… well, I’m not sure. (I haven’t finished entering my hours after September 18 yet; sorry, MNat office!) It’s more than the required 40 hours, even without travel time. I’ll update this once I’ve calculated the total. 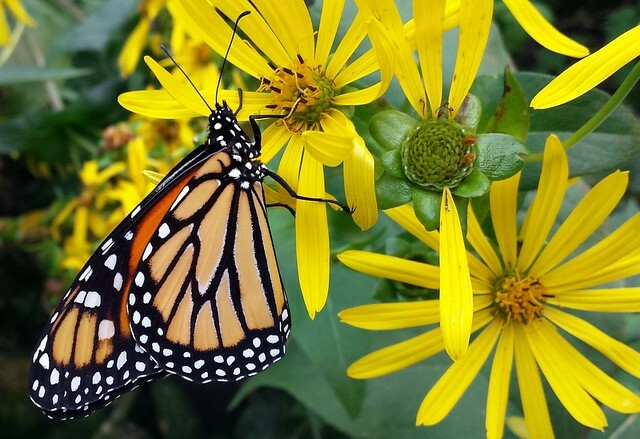 In 2017 there was so much monarch activity going on in the front yard, I honestly couldn’t keep up with all the eggs, caterpillars, and butterflies. 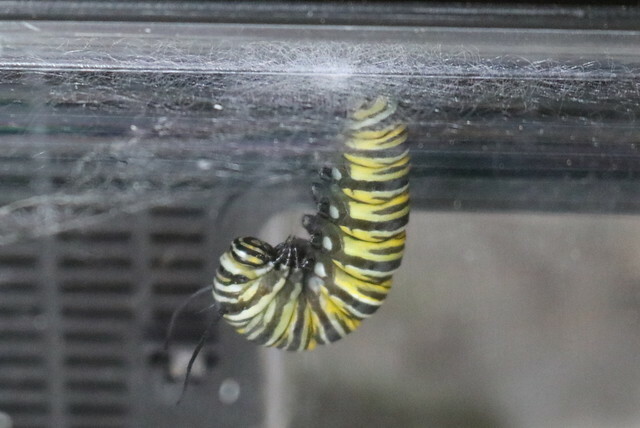 It was a very entertaining change compared to the previous year, when I found only one caterpillar! 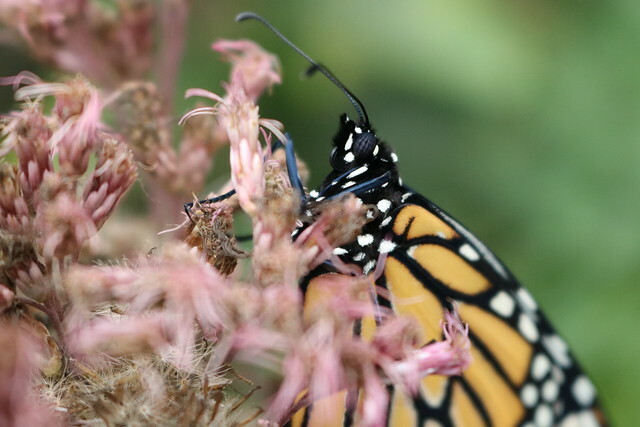 The season started really early, with a monarch laying eggs on May 26. I watched at least eight or nine of them (it’s not always easy to find all of them at once to count them) grow up into full-sized caterpillars ready to pupate. 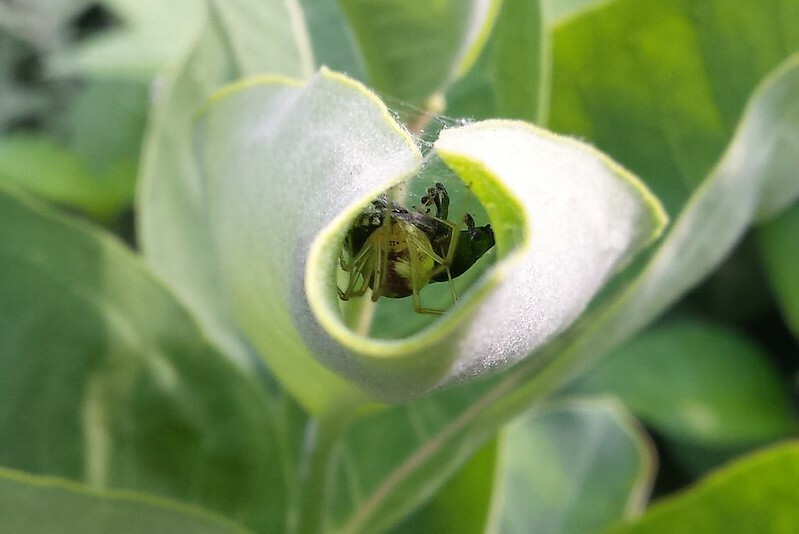 Most of this action happened on the common milkweed. 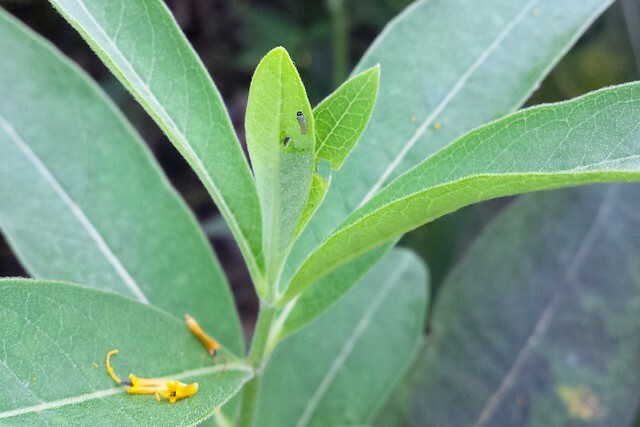 After spotting six eggs on one butterfly weed, I only found caterpillars there once or twice. 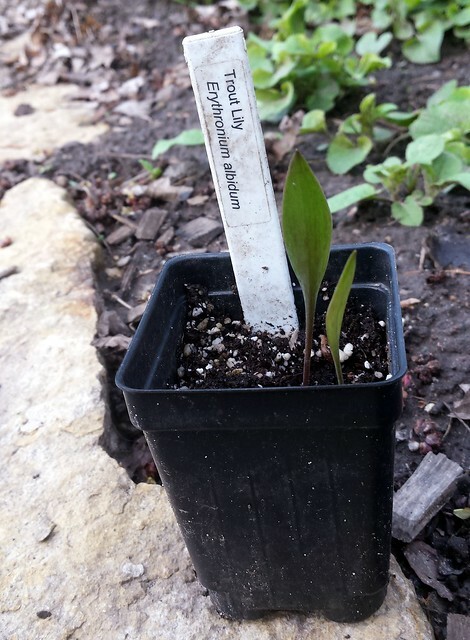 In previous years I had planted swamp milkweed seeds in the front yard but never saw them appear. 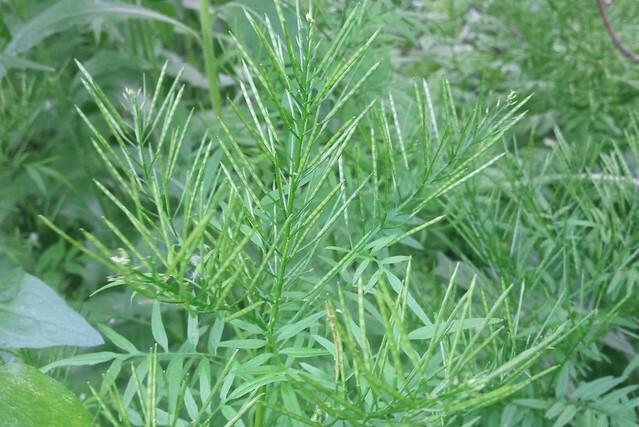 In the backyard, I had tried a couple of other varieties such as whorled and the “hello yellow” butterfly weed cultivar, but they were either eaten or overtaken by weeds. 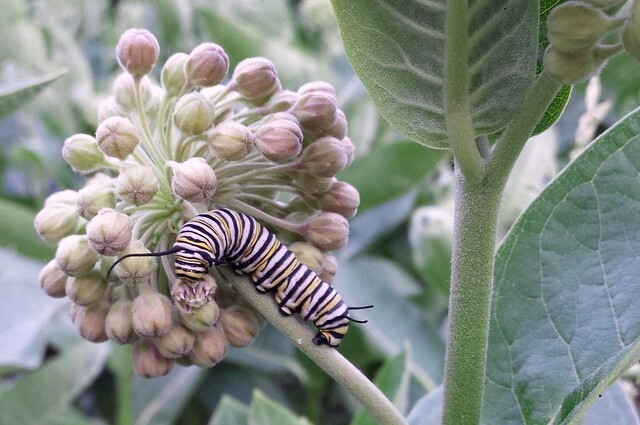 Last year, I decided to get serious about trying other milkweed varieties, to not rely too heavily on common milkweed, which often fades too early for the later monarch generations. 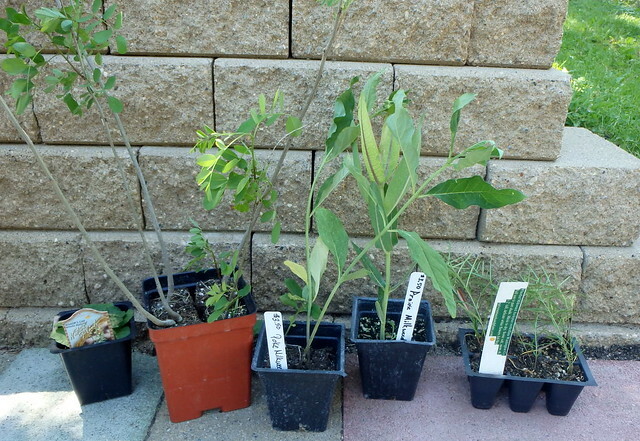 So in June I picked up a few new milkweeds at the Landscape Revival plant sale: poke, prairie, and whorled (along with a couple non-milkweeds). 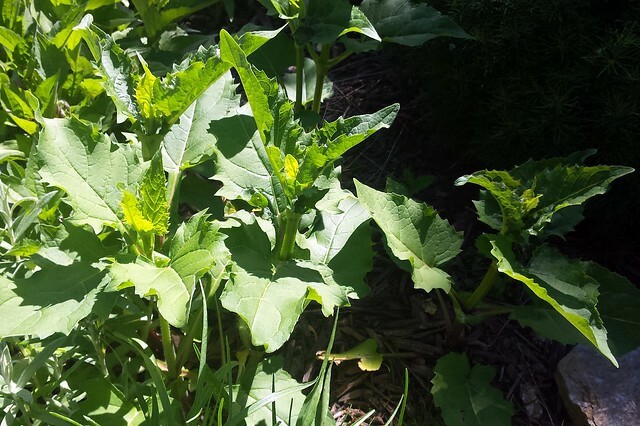 … and that seemed to make a difference — not only did all of these survive, so did the whorled from years past that I thought was lost, as well as a couple of others that were not planted this year and so I’m not sure what they were. 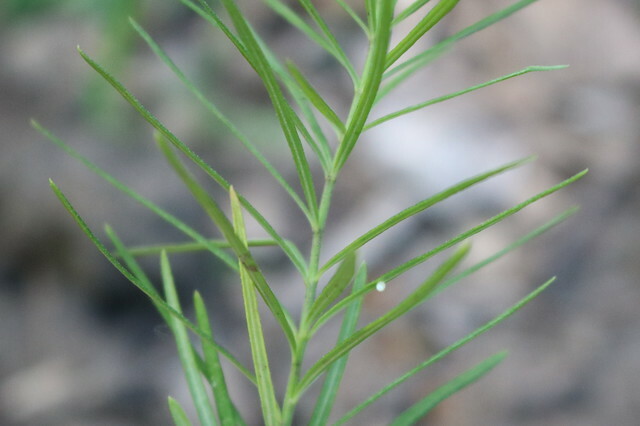 One was a butterfly weed that may have been the old hello yellow or may have been from seed that wandered over from the front yard. The others, I don’t remember at this point; I hope they come back and flower next year so I can find out what they are. 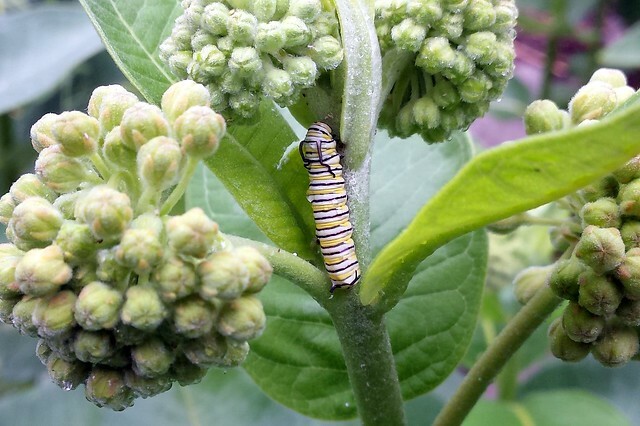 But I know that they were milkweeds because all of these, old and new, planted and surprise, ended up with monarch eggs and then caterpillars! 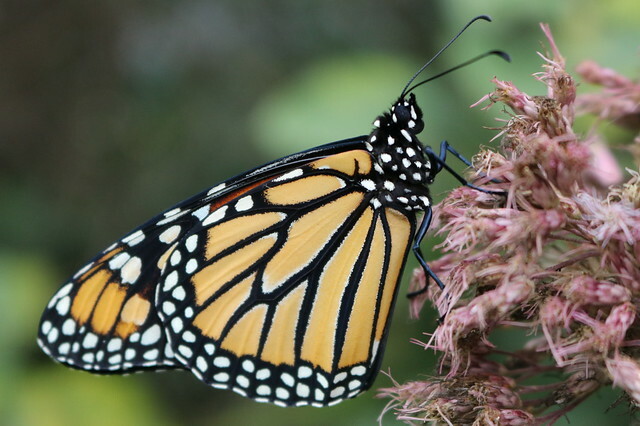 One afternoon while I was giving a garden tour for my Butterfly Buddy, a monarch flew into the backyard to lay eggs. The most amusing part of her visit: she couldn’t figure out how to get over the chicken wire fence protecting the plants, so she first flew all the way around the perimeter, then landed in the middle of the fence and squeezed through one of the small wire openings! I’m really glad there was another witness for that because I’m not sure my husband believed me when I told him later (and I don’t blame him). 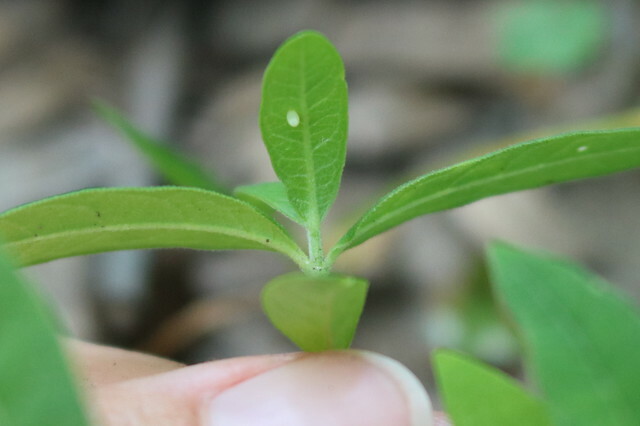 When I checked the plants later, I found out that not only had she picked this small showy milkweed, she chose a leaf that already had a hatchling! 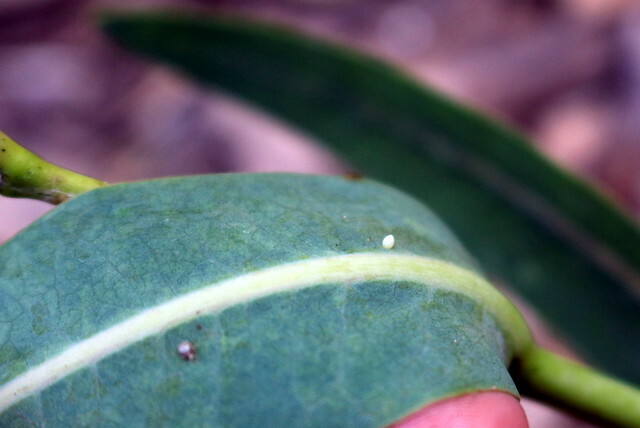 And on the same plant was a row of four lacewing eggs. 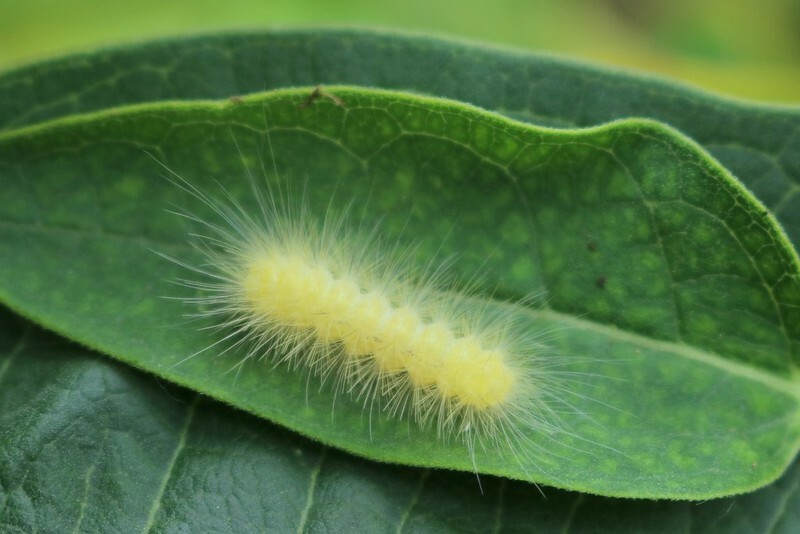 When I went back to take a picture with a better camera, the caterpillar had already eaten the egg! That’s one way nature deals with competition, I guess. 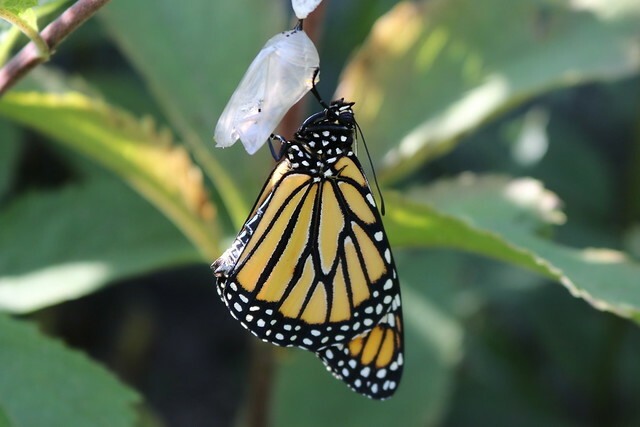 In all, I counted seven kinds of milkweed in the backyard, and this monarch laid an egg on six of them! 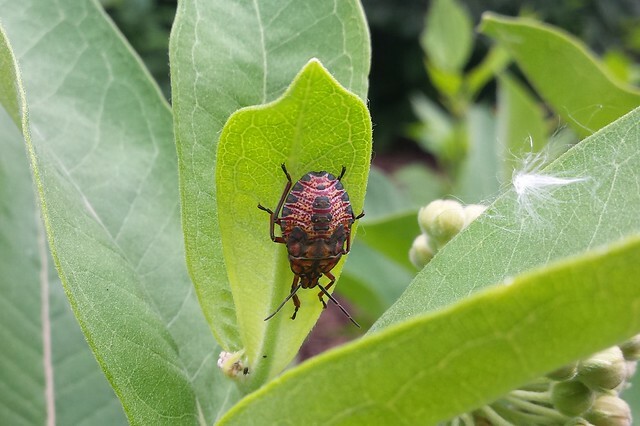 I don’t know whether she also visited the common milkweed in the front yard, but this was a good validation for my plan to plant more species for later generations. 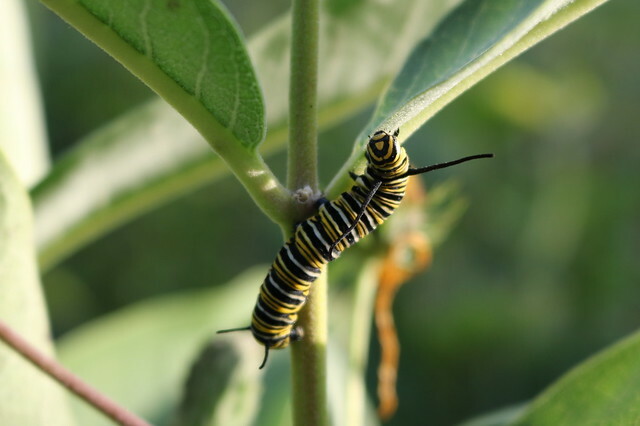 Are whorled milkweed leaves really big enough to support caterpillars? 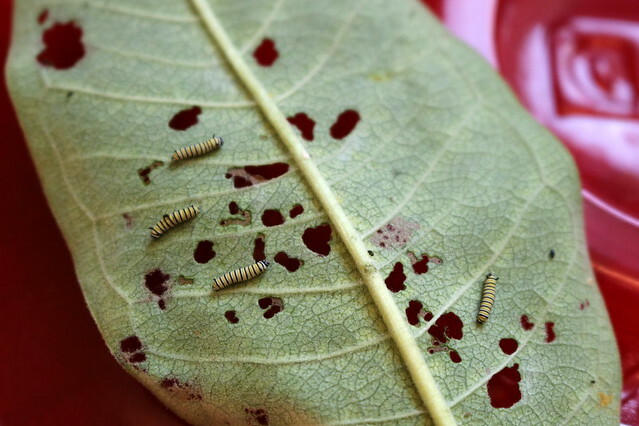 What happens when the caterpillars grow past, say, the third instar? 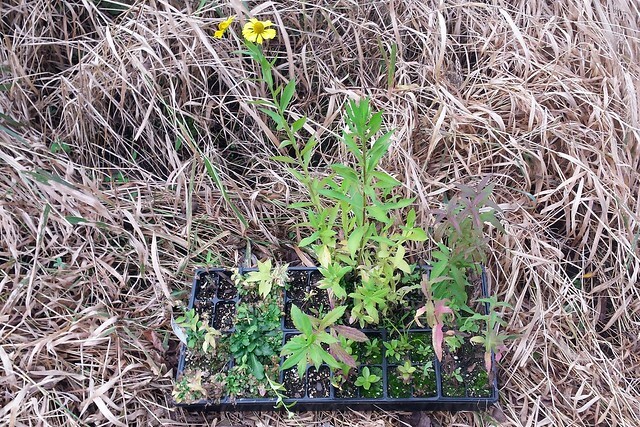 Nearly all of these plants were very small, not just the whorled milkweed (which is always small, even when fully grown). 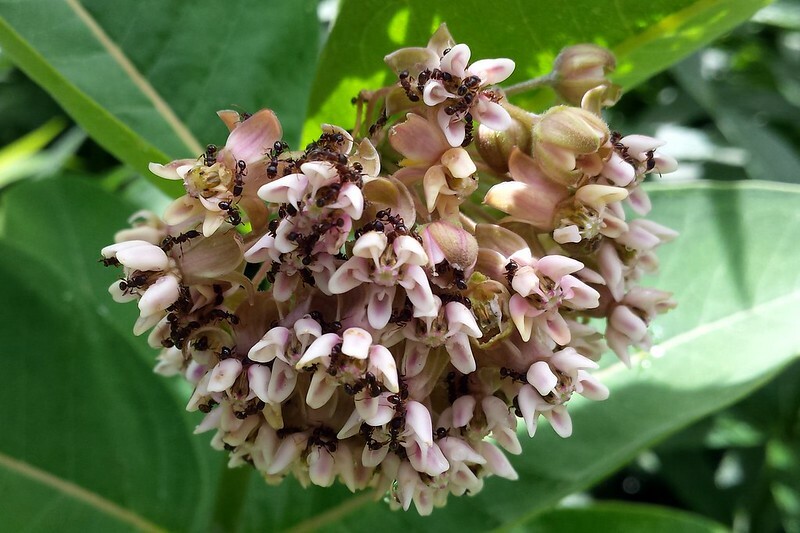 The exception was the poke milkweed, which was definitely not a first-year plant when I bought it. 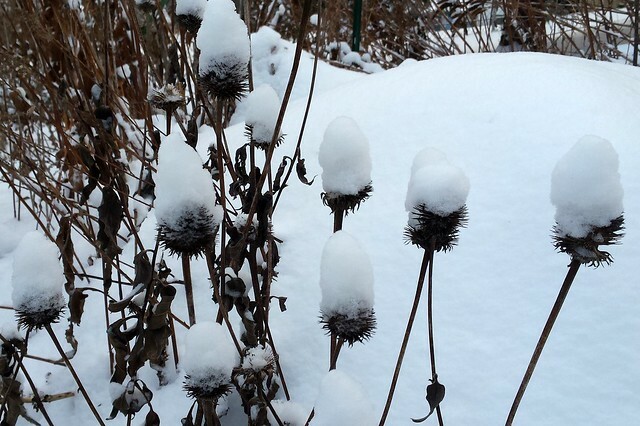 None were big enough, or perhaps it was that they weren’t established enough, to flower. 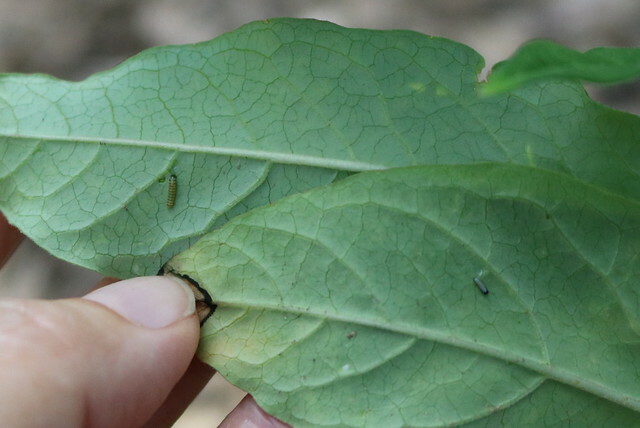 I saw many caterpillars over the next couple weeks, but as I had worried, I saw none past the third instar. I’m not sure why: not enough food, too much competition, predators, moved to another area (though the front yard is quite far away for a little caterpillar), or something else. 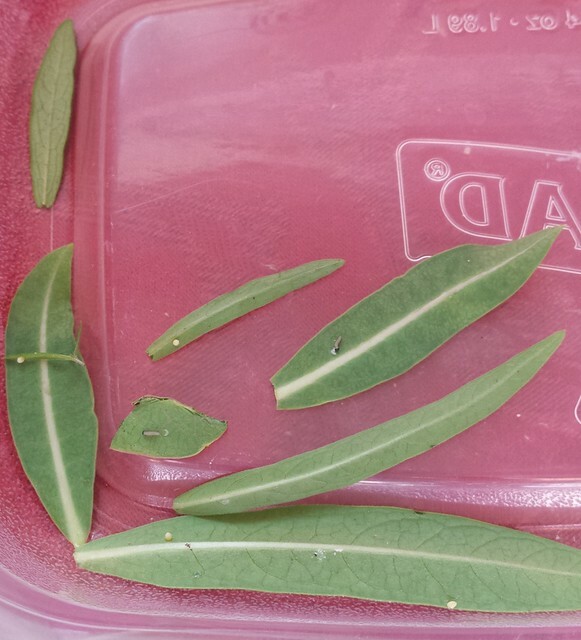 Following that generation, the next time I saw new eggs on the backyard milkweed, I collected eight of them to raise indoors. 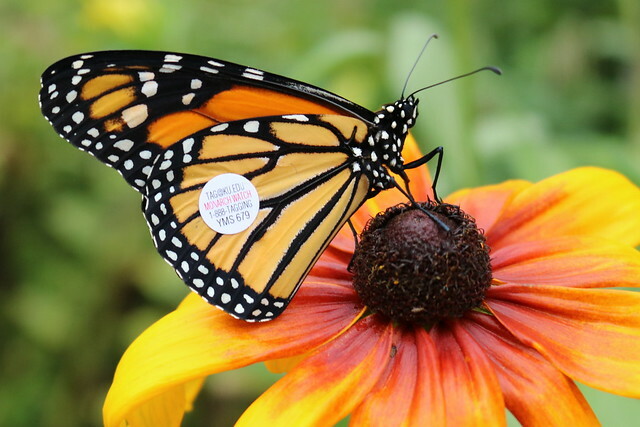 After this amazing season of monarchs indoors and out, I’m hoping for another good local population in 2018 and will plan to order tags for the migration generation. 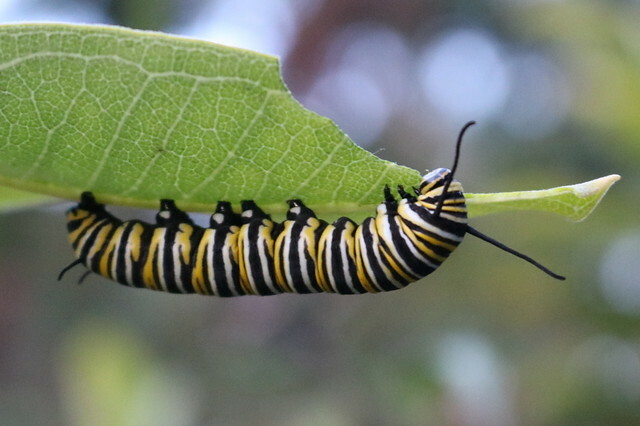 After a disappointing monarch season in 2016, I was thrilled to find many eggs and caterpillars in my yard in 2017. 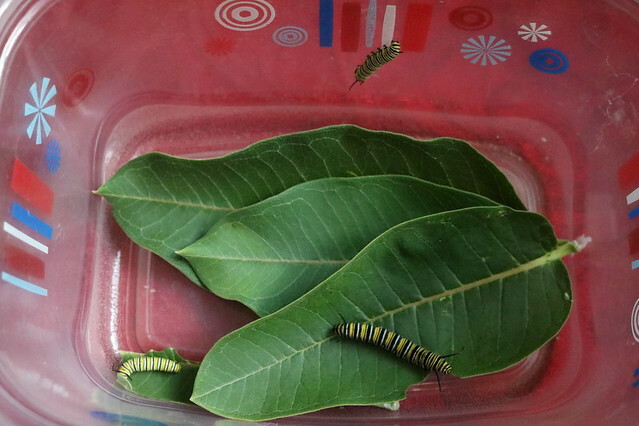 Some became temporary “inside” monarchs when I brought eggs indoors to raise the caterpillars and then release them outside as butterflies. 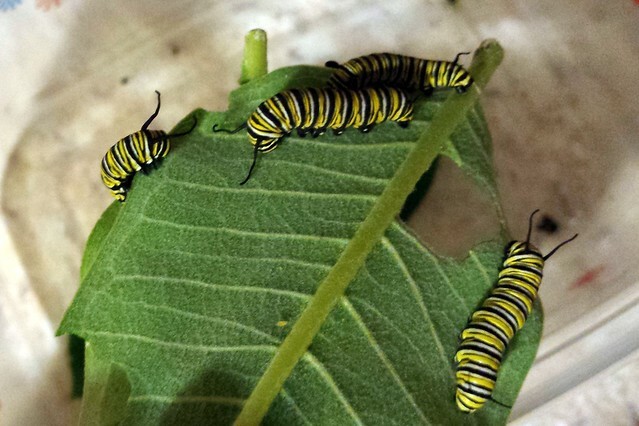 After seeing a monarch lay a dozen eggs at the end of May, and then finding many more eggs in the yard on the butterfly weed and on the common milkweed, I wanted to bring a few inside to watch them grow. 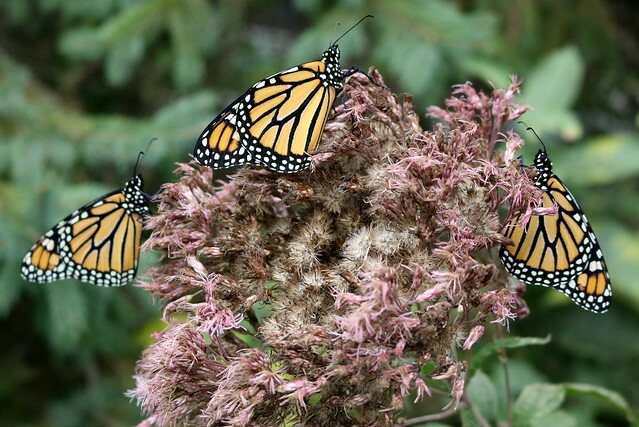 …and send me updates on the three beautiful butterflies! 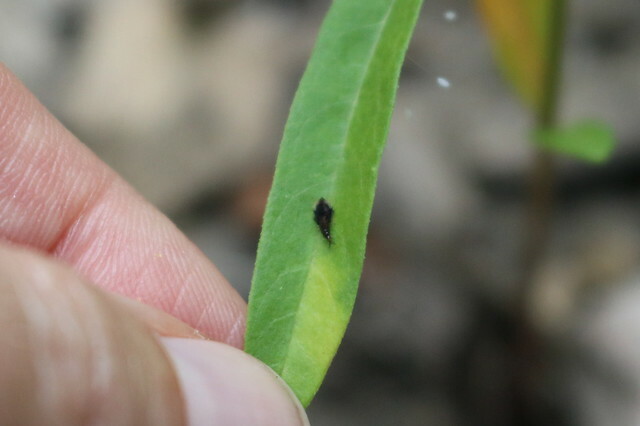 It was during this period that one of the caterpillars met a sad end when I wasn’t paying enough attention while cleaning the cage and grabbed a leaf exactly at the spot where it was sitting on the other side. I tried to console myself by noting that this one was much smaller than the others and not progressing well anyway, but it still was my fault. August 30: My first release of the season! A watched chrysalis never opens. Isn’t that how the saying goes? 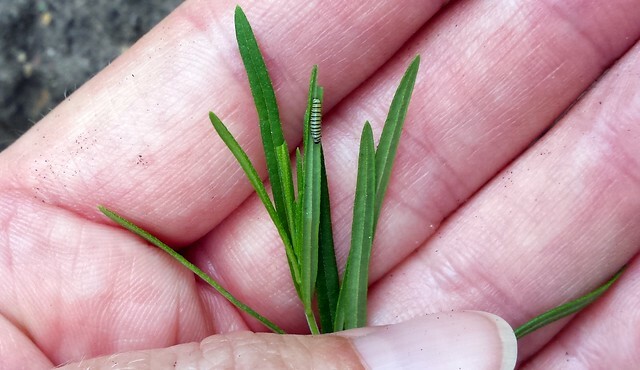 Even though there were three chrysalises like this on Sept. 1, I didn’t see any of them open! Two more were nearly ready that day, but in unfortunate timing, we were planning to leave for a weeklong trip the next day. 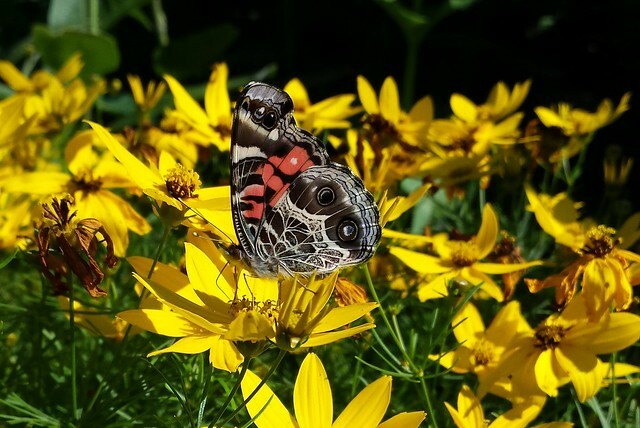 This time I hadn’t planned ahead enough to pass them off to my Butterfly Buddy, maybe because I had optimistically thought they would have emerged sooner. 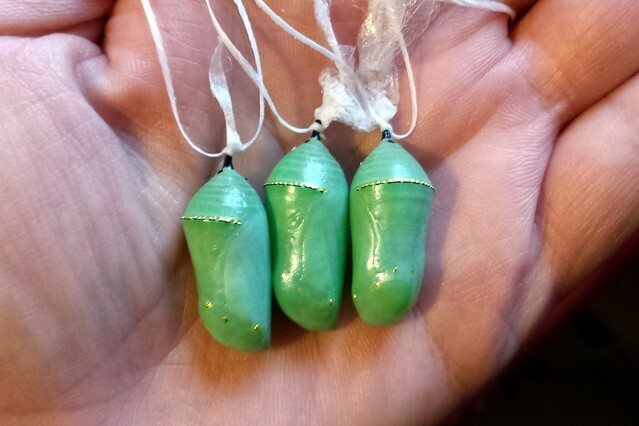 So I did the next-best thing and tied the chrysalises to joe-pye weed plants so they could eclose outside and fly off on their own. Luckily for me, one of them did emerge before we left, as I was waiting impatiently but not impatiently enough to pay close enough attention, and it was almost all the way out before I noticed. I’m always surprised at how quiet this process is; I was standing right there and didn’t hear a thing. 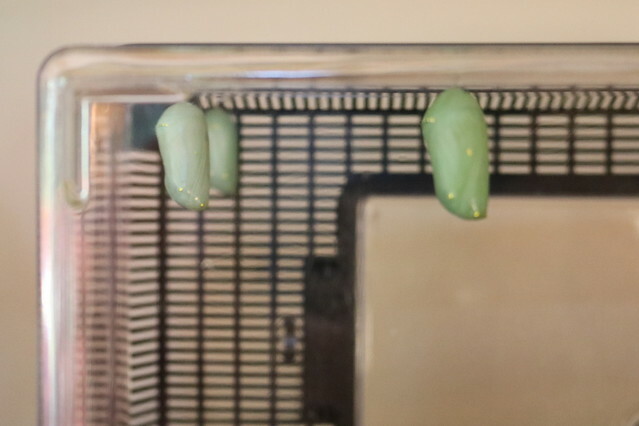 The other one apparently emerged safely, since we found an empty chrysalis when we returned. 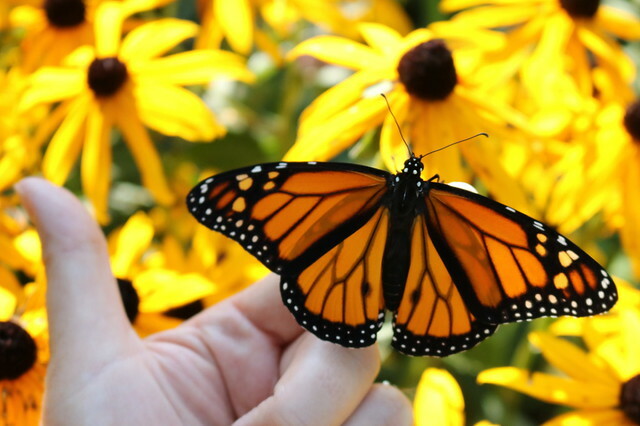 On the autumnal equinox, he became my last butterfly of the season. 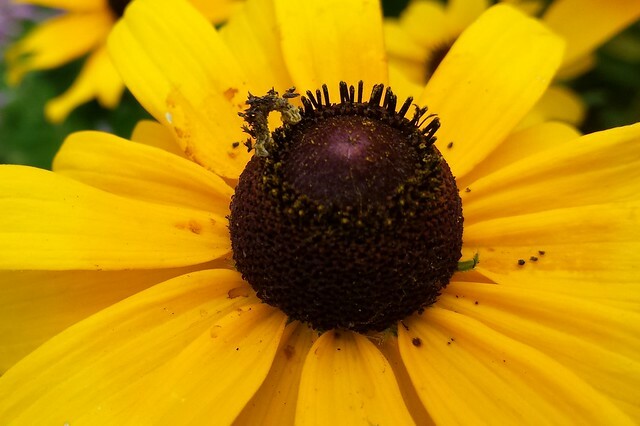 On July 13 in the mass of black-eyed susans, I spotted more than a dozen different kinds of insects. 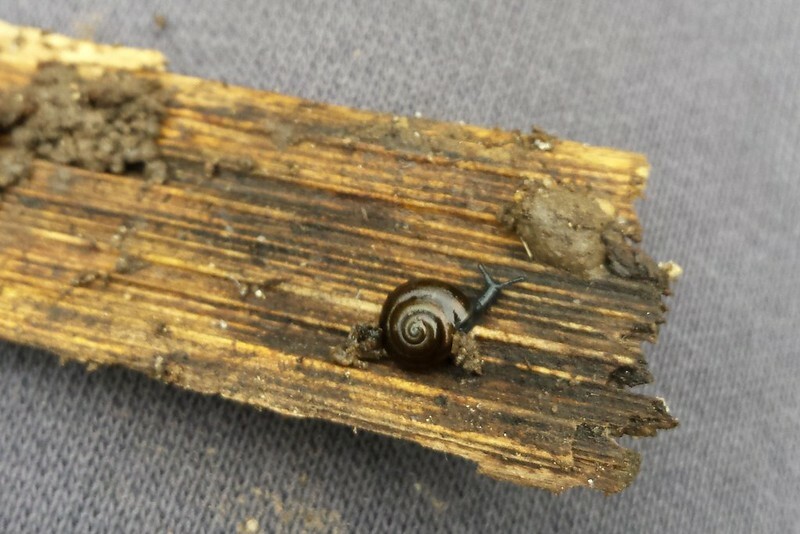 The coolest was this one, which I believe is a camouflaged looper inchworm. Its destiny was to turn into a wavy-lined emerald moth. 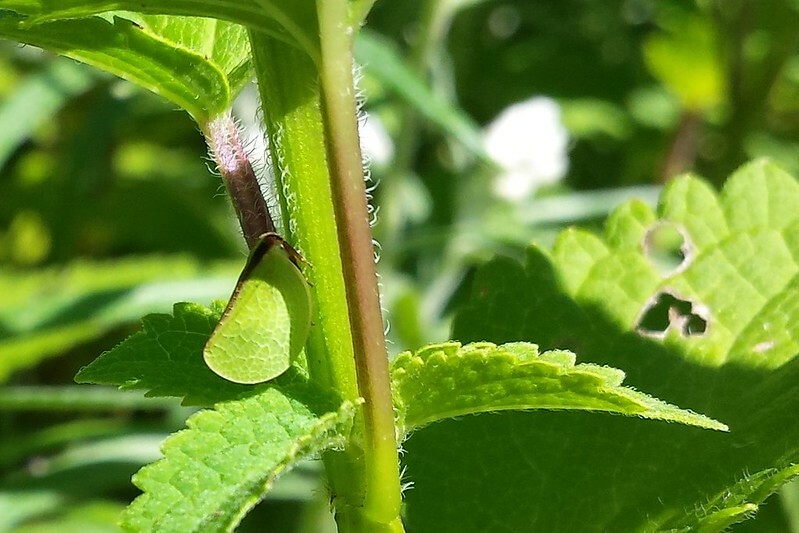 This caterpillar chews off parts of plants and then attaches them to itself as a disguise. 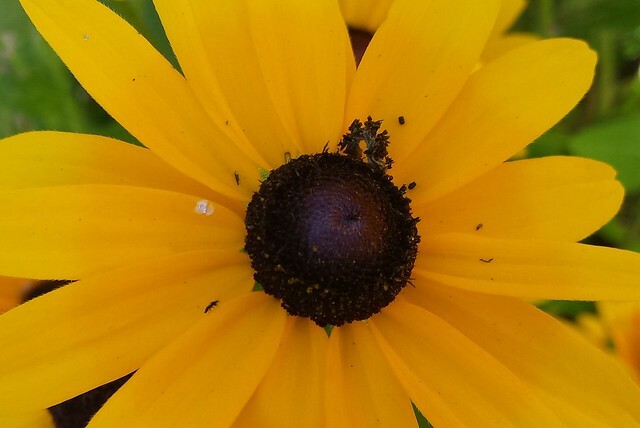 It was concealed so well against the flower’s dark-brown center disk, I’m not sure how I even spotted it at first! 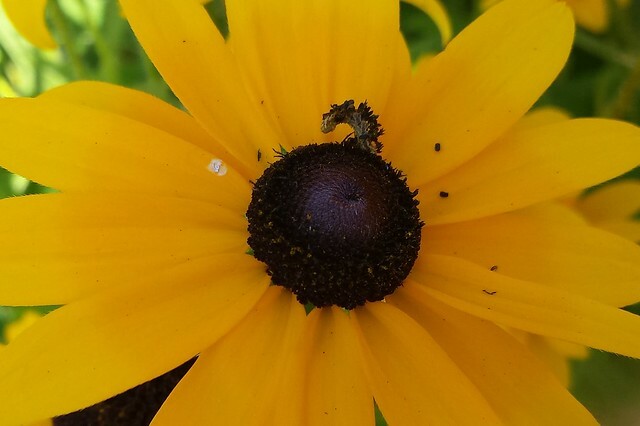 I kept checking back for this inchworm every day for a week and saw it many more times. 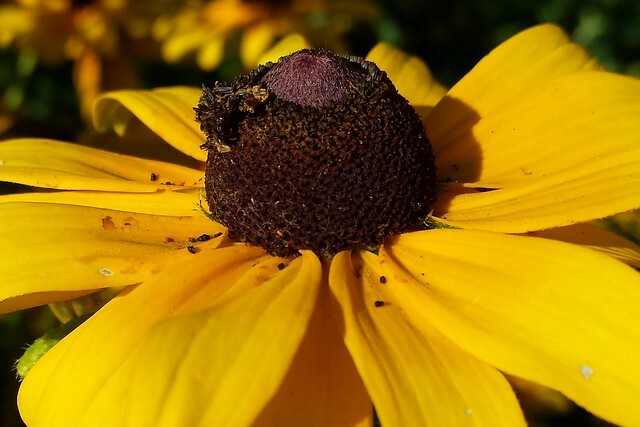 Sometimes it was resting on a petal, and in these cases it looked nothing like a caterpillar. 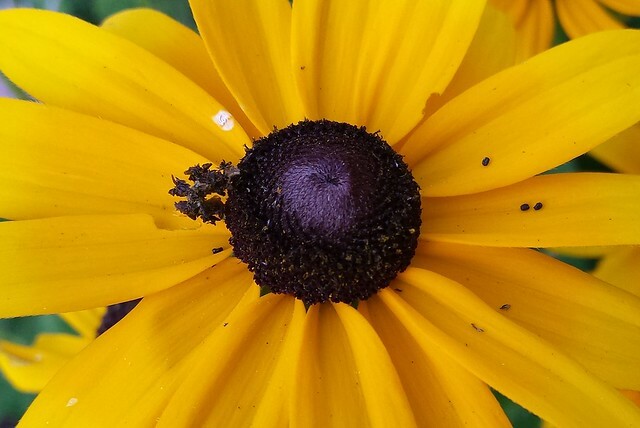 Once I thought it was gone, but then found it again on a nearby flower. This time it looked different after it apparently re-covered itself with new material. 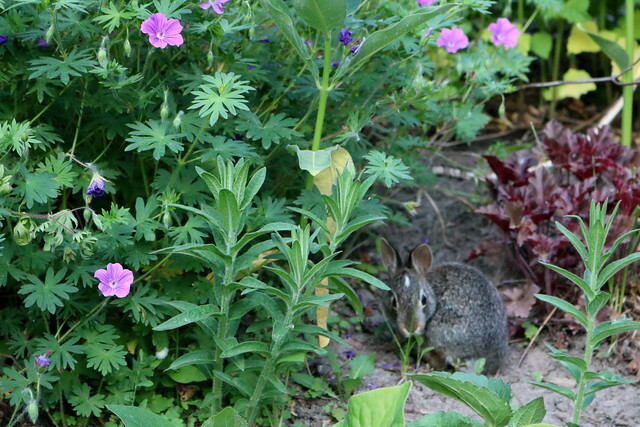 And this time I saw it eating the petals, too. But after that, I didn’t see it anymore. 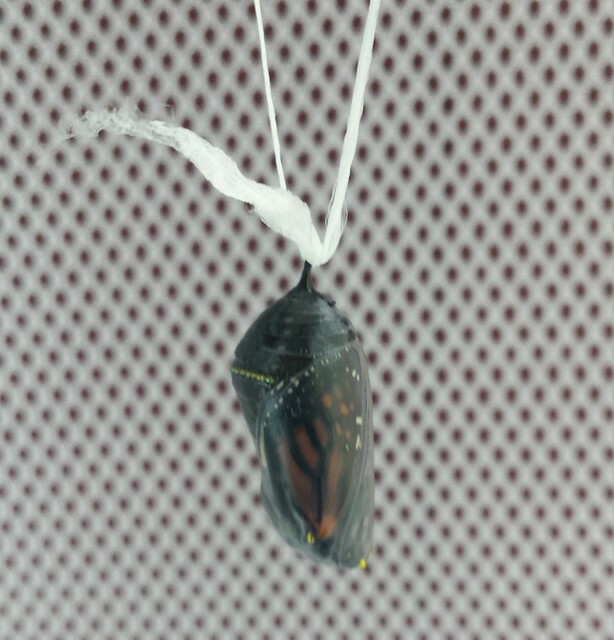 Hopefully it made its way safely to its next stage as a cocoon. 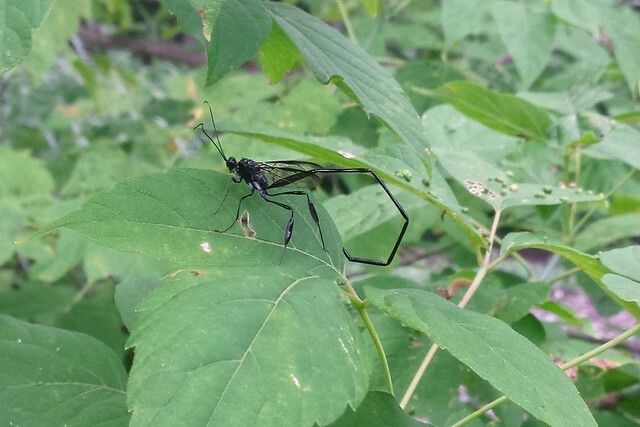 On August 15 I found something in our box elder tree that is definitely not a box elder bug. 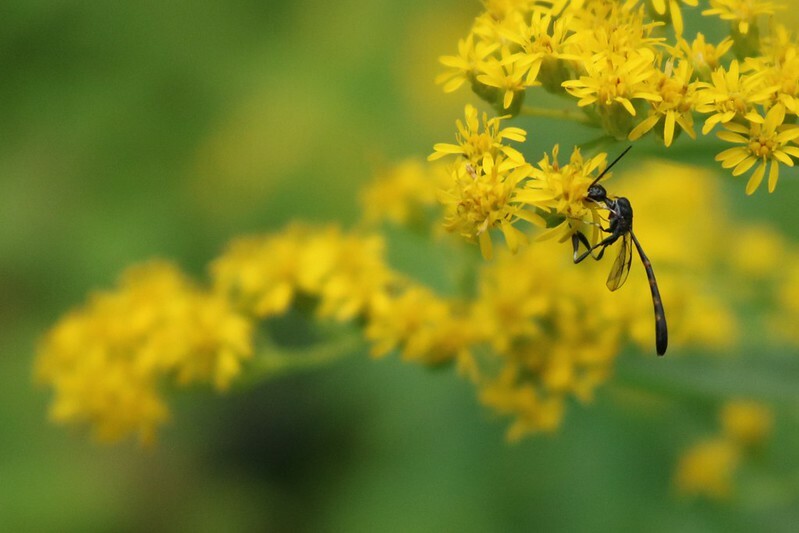 A quick Google image search (“mn fly with scorpion tail”) identified it as a wasp, American Pelecinid, that looks intimidating but doesn’t have a stinger. 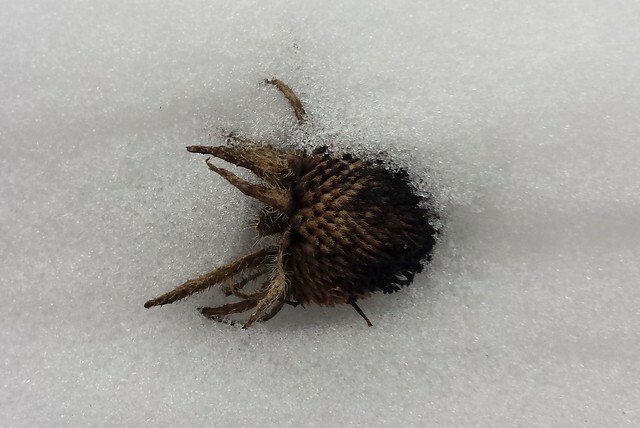 It uses its long abdomen to dig into the ground until it finds the grub of a June beetle, and there it lays an egg that will feed on the grub. 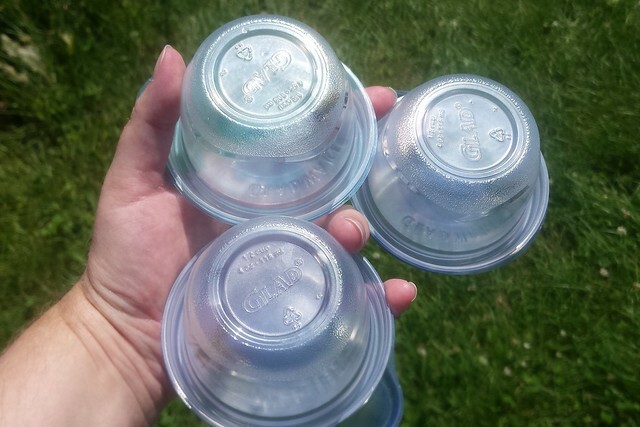 It would be nice if it would look for Japanese beetle grubs, too. 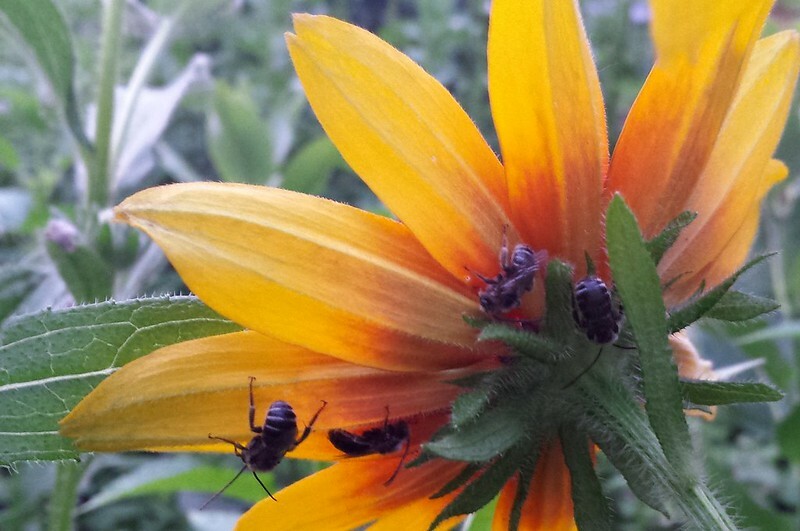 Two weeks later, at a seed collection event, one of these insects landed on another volunteer. 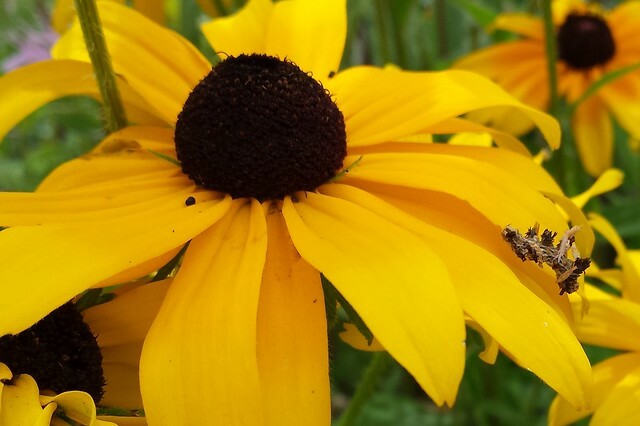 No one else knew anything about it, and I was so excited to share what I know about this wasp, including that it’s harmless. However, I couldn’t remember its name, and so I looked it up on my Instagram feed. 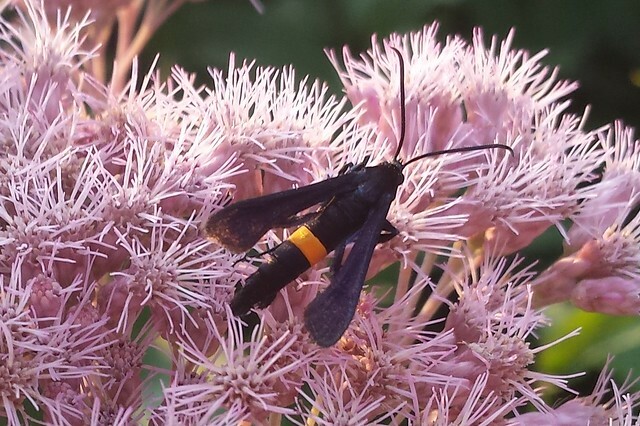 In my excitement to share, I called it a PELICAN-id wasp. It wasn’t until about five minutes later that I realized it’s probably pronounced “pell-i-SIN-id” instead. (And yes, according to a Google search, that second version is true.) I was embarrassed the rest of the event, and I don’t think I’ll forget the name again. 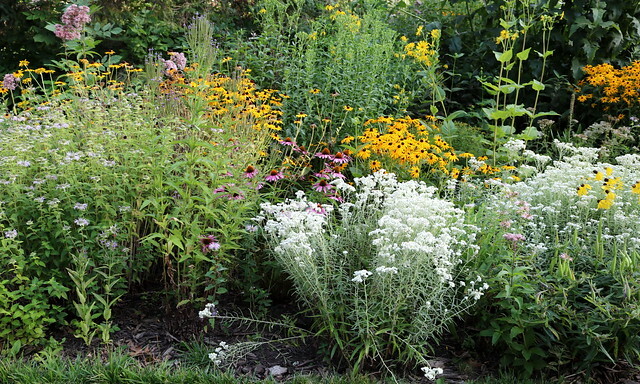 At the end of another cold snap, it’s fun to look back at pictures of the garden in its prime. 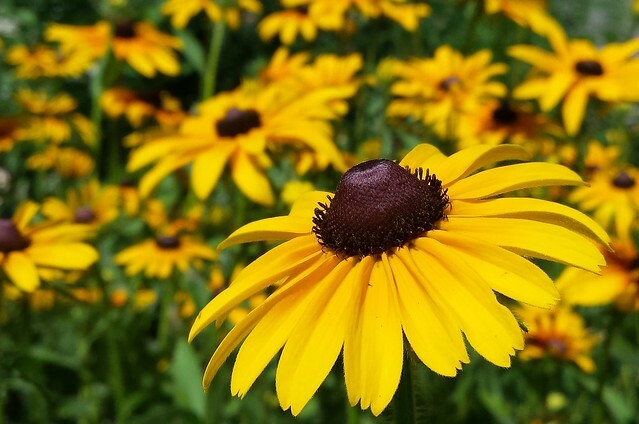 Obviously, as I’ve documented at length already, black-eyed susans were the star of the show. Blooming from late June to mid-August, taking up a huge spot right in the front of the garden closest to the street, they were amazing. 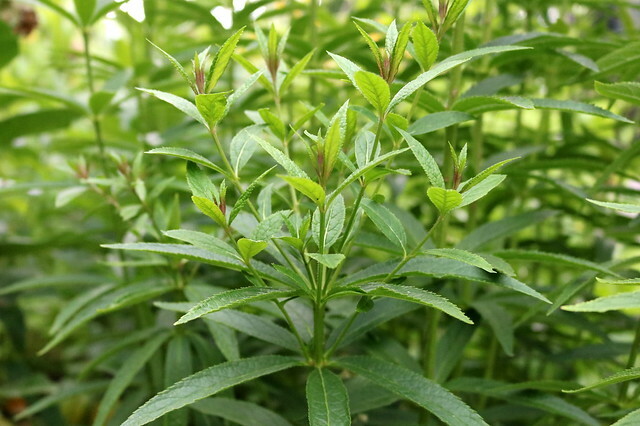 This is the year that the cup plant “leaped” — more than a dozen new plants grew away from the original cluster. Of course, not everything succeeded. 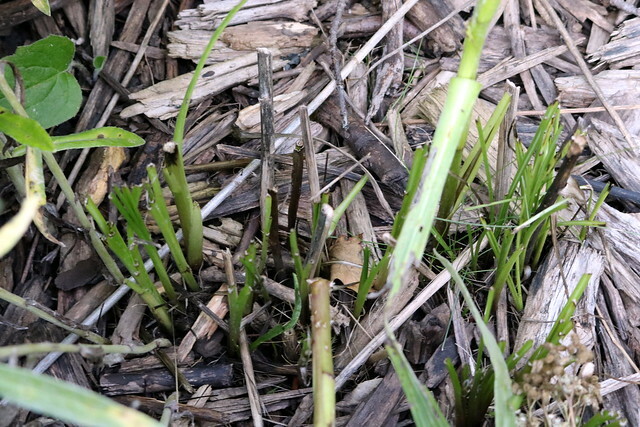 Trout lily and bluebells didn’t grow, but this was completely my fault. 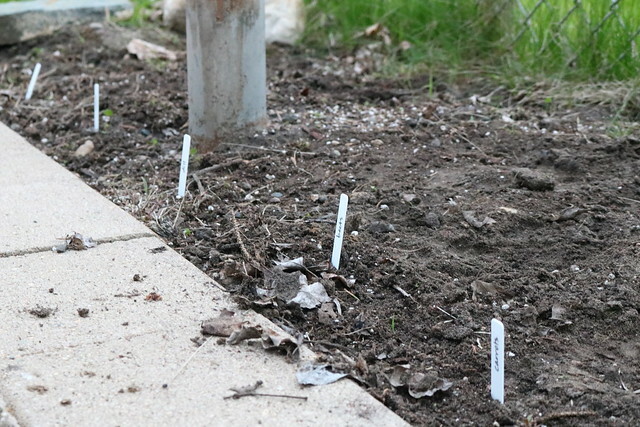 I never got around to planting them, and the little pots blew over in the wind and then something ate them. 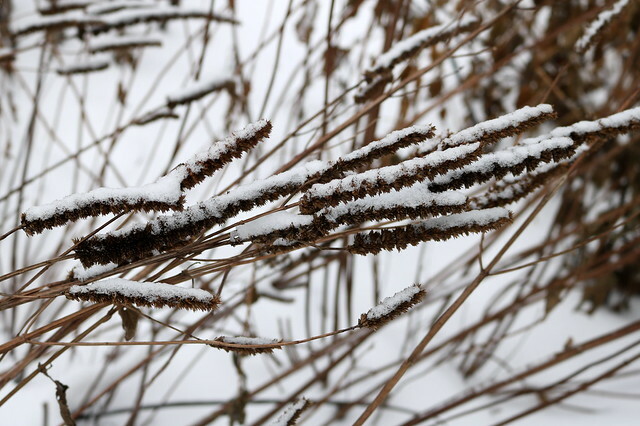 Blazing star was eaten by rabbits (though I planted more seeds in the fall to try again). Vegetables didn’t grow, again. Tried in a different spot this time, too. This might be the last time; we can rely on farmer’s markets and the co-op for our fresh veggies instead. 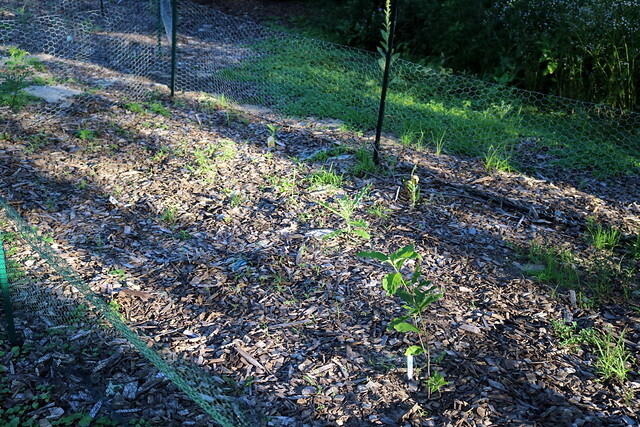 Even the path through the garden: it disappeared around the end of June, engulfed by plants that I didn’t have the heart to pull out (or the time to transplant). 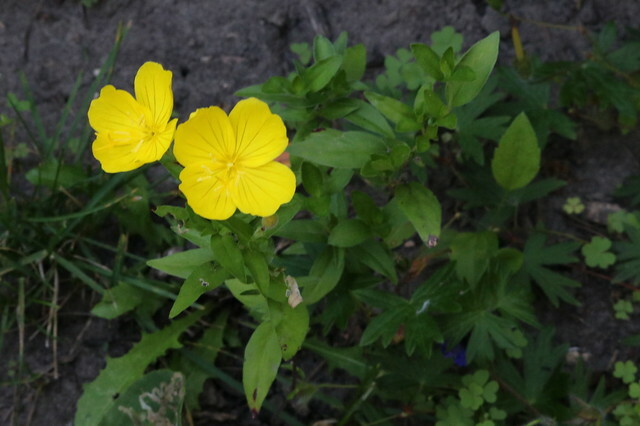 Every year it seems as if one non-native perennial fades or doesn’t survive, and this year it was evening primrose’s turn. bigger, flashier plants around them. 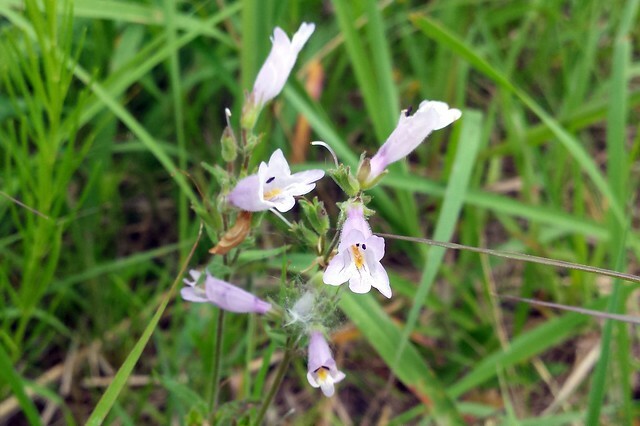 Lobelia from a friend. 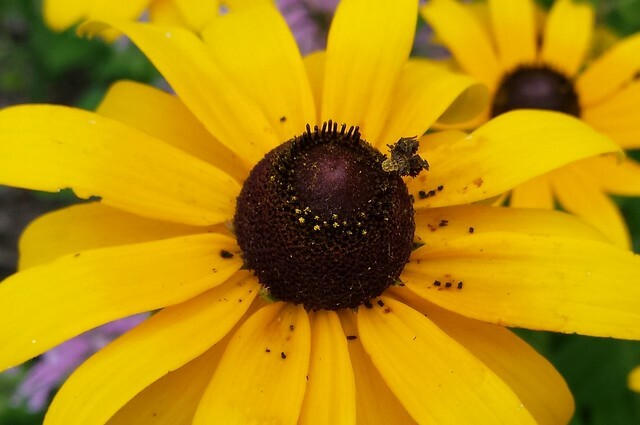 This is one of my favorite photos of the year because I have no idea how I managed to get the tussock moth caterpillar to photobomb this flower. 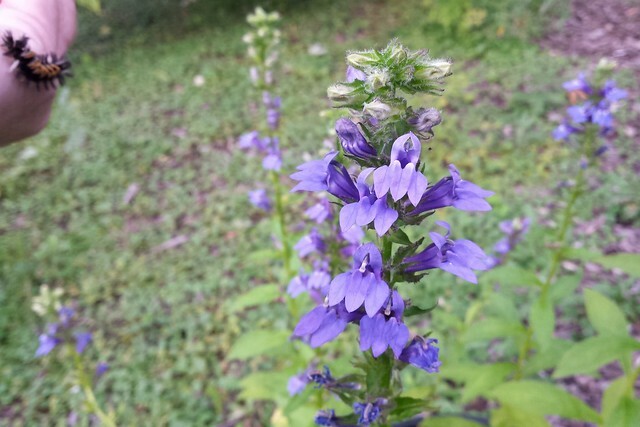 One day I was transporting caterpillars from the backyard (which ran out of milkweed) to the front yard (which had plenty) and apparently chose that moment to stop and take a picture of a lobelia! I wasn’t sure how to describe this one on Google to find its name, so I posted it on Instagram and asked for help. Within minutes, I got an answer: brown marmorated stink bug nymph. 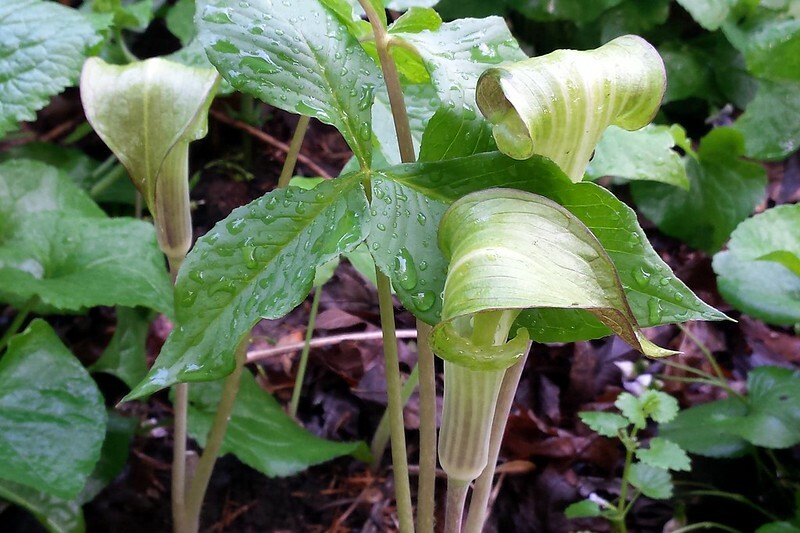 Here’s what I wrote on Instagram in June, on my first master naturalist anniversary. I think it summarizes my year’s exploration nicely. Today is my master naturalist birthday: one year ago I earned a certificate for completing the prairies and potholes course. Taking this class was one of the best decisions I’ve ever made because it reinforced my growing interest in the natural world. 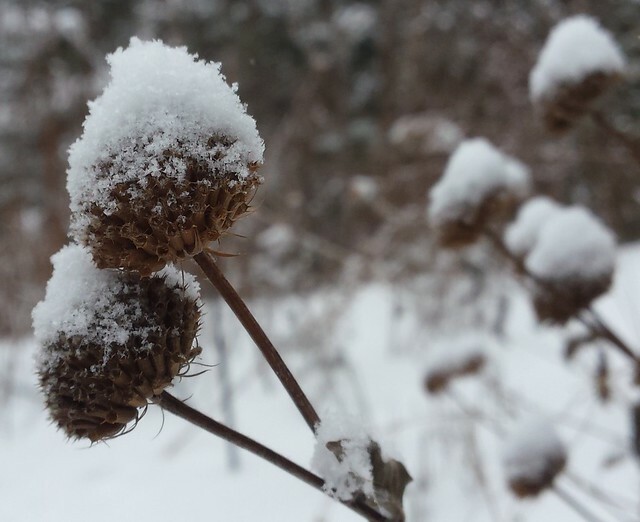 Since then I’ve learned a lot and committed to environmental stewardship through events such as invasive species removal, wildflower planting, and seed collecting. But my favorite place to explore remains my own front yard. 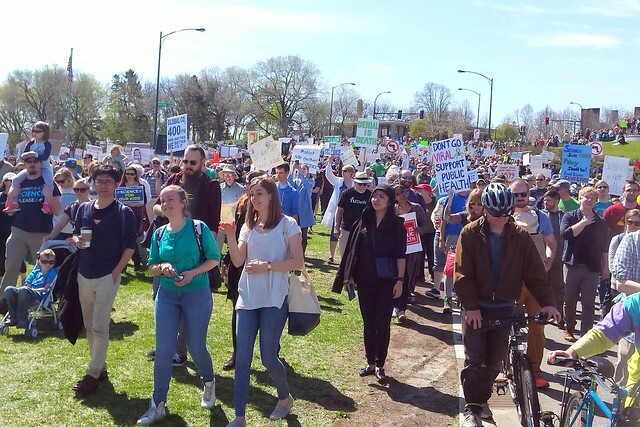 In 2017 I started to get more involved in learning about the environmental movement. The public side of that work is not an easy thing for an introvert. 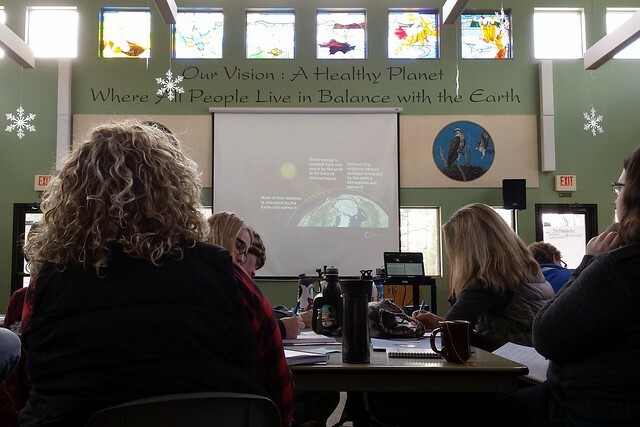 In March I participated in a three-day workshop about how to teach about climate change issues (for people who are not educators), led by Climate Generation at the beautiful, peaceful, sustainable Audubon Center of the North Woods near Sandstone, Minnesota. 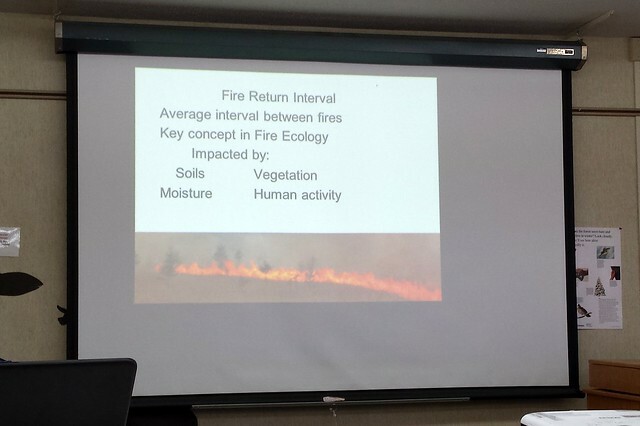 I started the session feeling out of my element, since most of the rest of the attendees work in an environment-related field. I worried I lacked credibility, but quickly learned that interest and passion are enough. 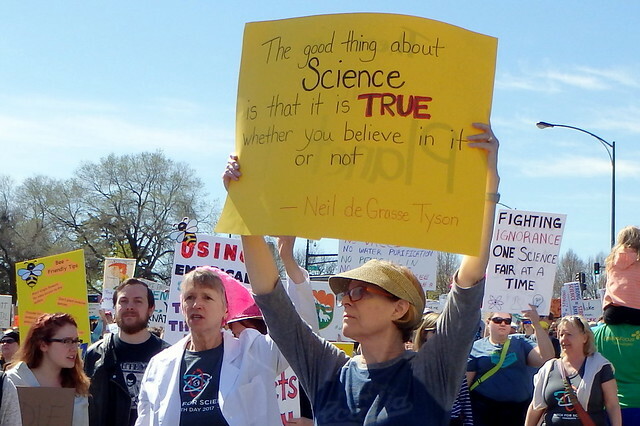 I wanted to learn about the science behind climate change, as well as to be able to discuss the facts when needed in everyday life, because at this point I am not planning to be directly involved in advocacy work. 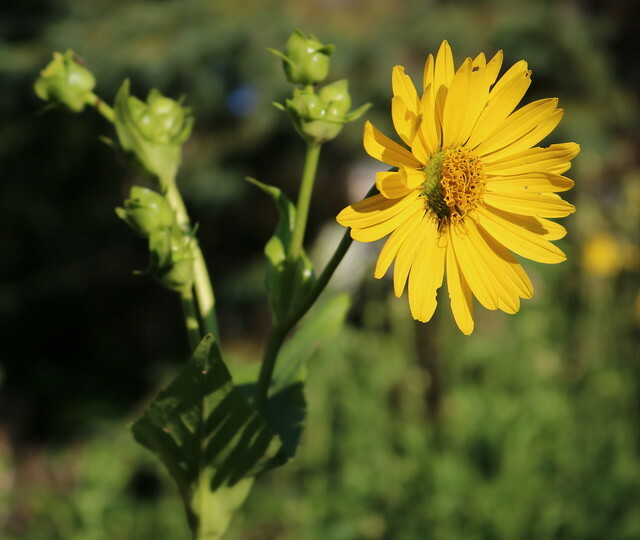 Not surprisingly, my interest comes from a love of nature, particularly wildflowers. 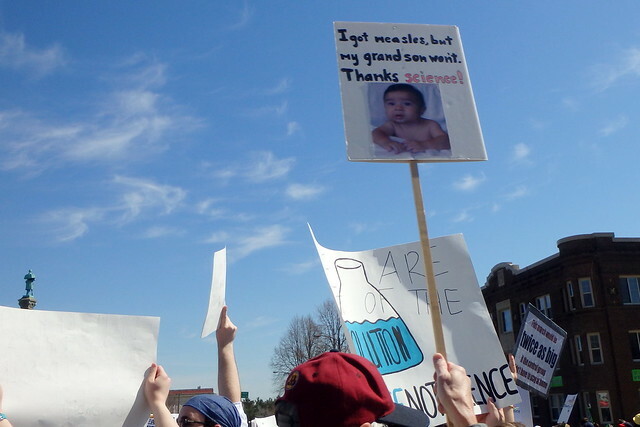 I want to make sure nature is available for future generations. 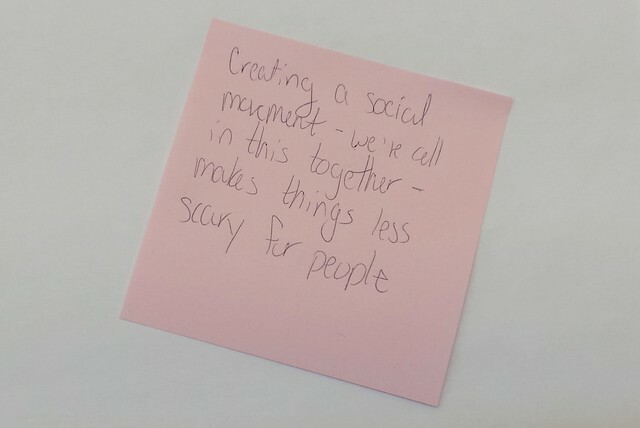 These words spoken by one of the instructors made so much sense, but I thought it was important to write them down and remember them: Being outside in nature instills a value. Do it often. Take time to be quiet and observe. People see changes when they observe multiple times. 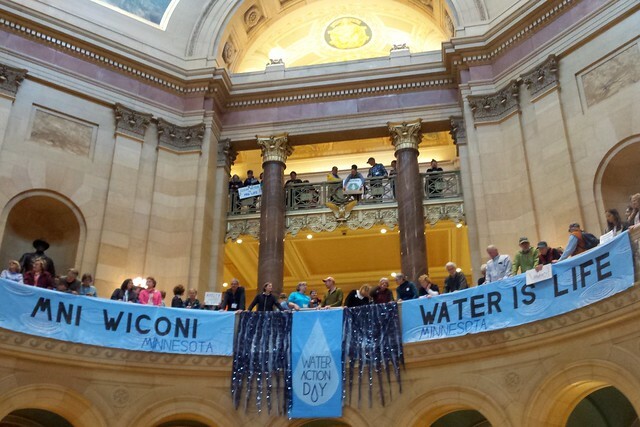 I walked to the Minnesota State Capitol over the lunch hour on April 19 to observe part of this all-day event that gives citizens the opportunity to talk to legislators about water issues. 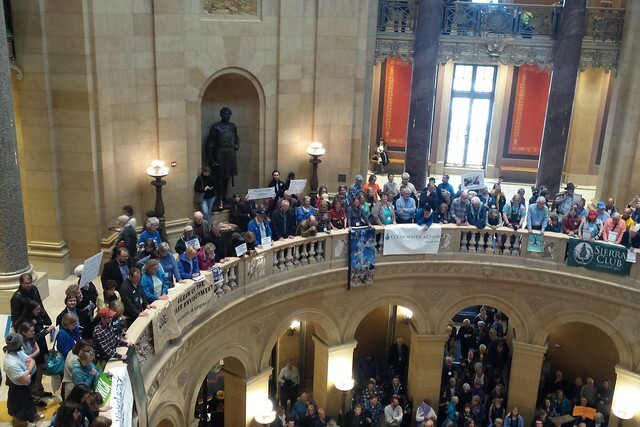 I was there only long enough to see the crowd gathering for a rally in the rotunda, but there were also trainings and scheduled meetings with state representatives. 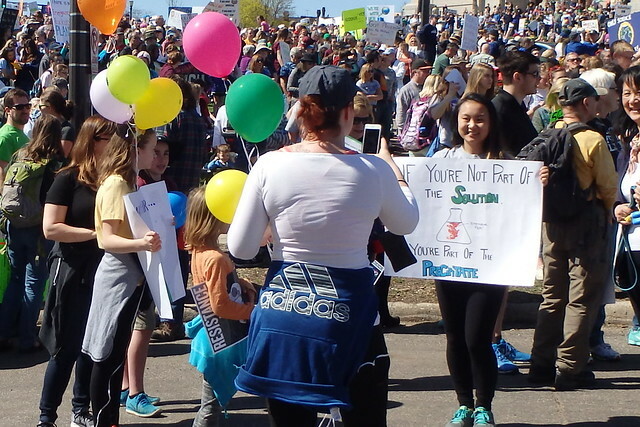 People started by gathering near the cathedral, walking around looking at each other’s signs and admiring the clever slogans or asking people to pose. 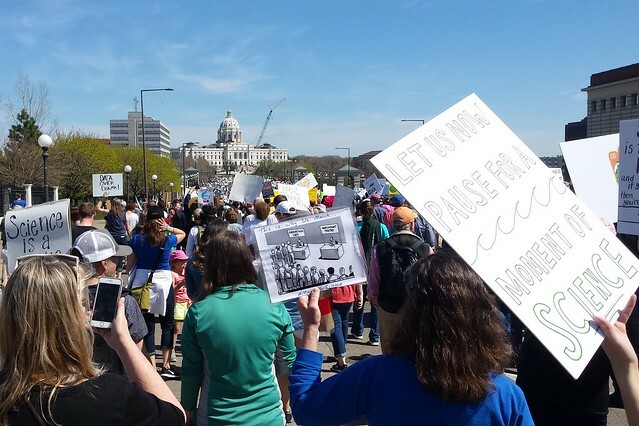 And then the crowd began moving down the hill toward the state capitol. 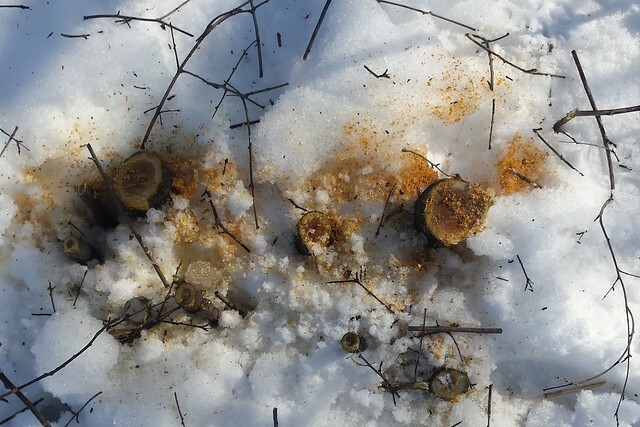 On a very cold morning in St. Paul, I learned how to identify trees that have been hit by emerald ash borer. 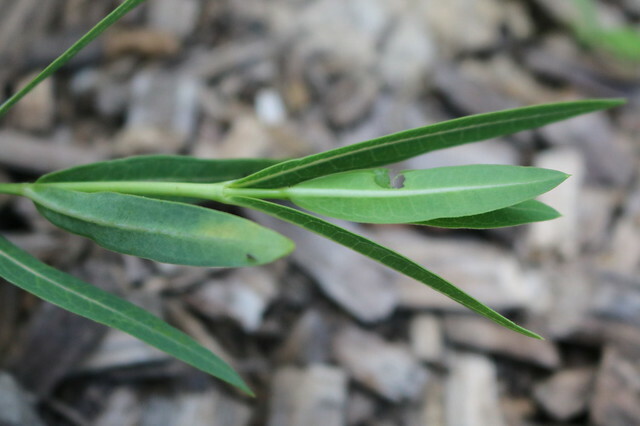 The branches on the left side of this image have some flaked-off bark, which is a sign of EAB. Not visible in this photo, but also present, are lots of woodpecker holes from birds looking for the bugs, which is another sign. 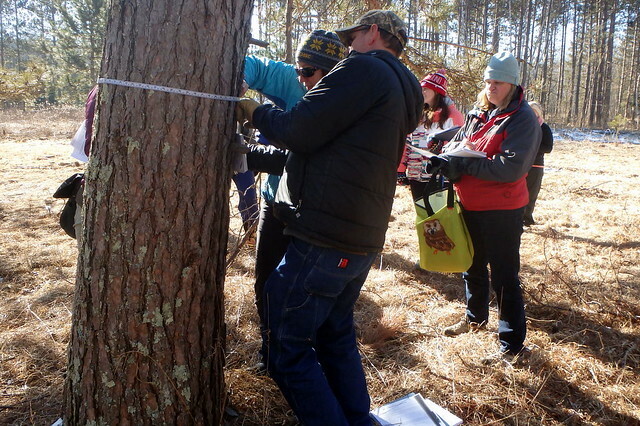 The trunk on the right side shows a section where a human manually removed the bark to show tunnels below, left by an EAB. 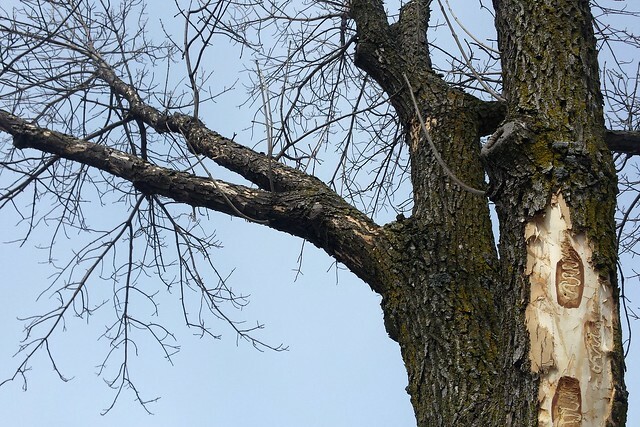 This tree was scheduled for removal, which made it a perfect example to study. 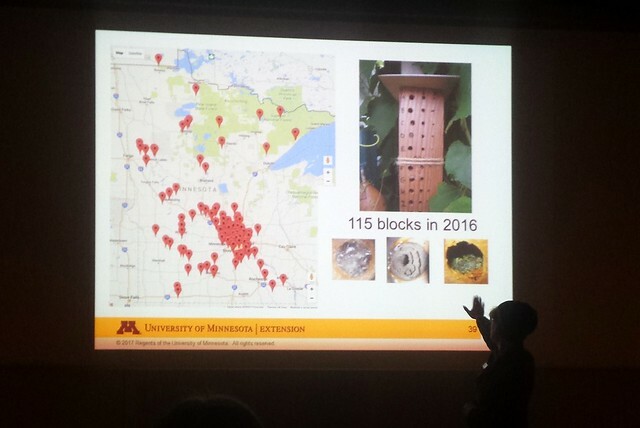 …and Aldo Leopold Day presentations about bees at the Minnesota Valley National Wildlife Refuge. Right before the end of the year, it was time for a new car. My old car, a Honda Civic, served me extremely well for 17 years — yes, 17 — and nearly 250,000 miles. But when it had an electrical problem the week before Christmas, we knew it was finally time to make the move we’d been considering for probably two years. I knew I wanted either a hybrid or an electric car, as an environmentalist who isn’t even close to being ready to go car-free. While I’m hoping for electric someday, I don’t feel that I am ready personally, and the local infrastructure isn’t quite ready enough, either. 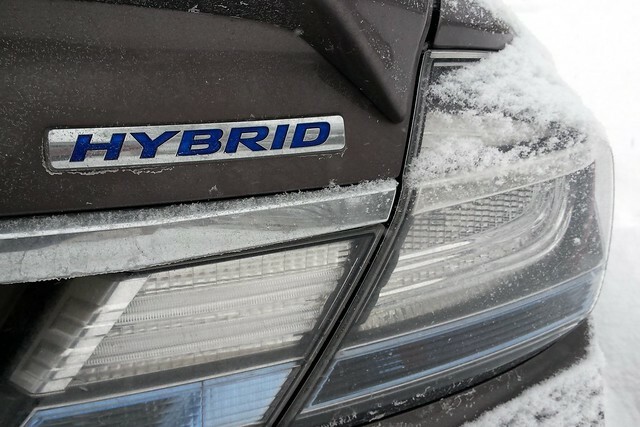 So, hybrid it is. And while I was a couple years too early for a Civic hybrid when I bought my car back in 2000, I was too late in 2017 because Honda has discontinued them. But fortunately, on the very day we decided to look for a used car, we found one at a local dealership. I’m still getting used to the “newfangled” features like keyless start and bluetooth connection, but I love being able to see the miles-per-gallon updates instantly and know how much the heat or highway-vs.-street-driving is affecting that.